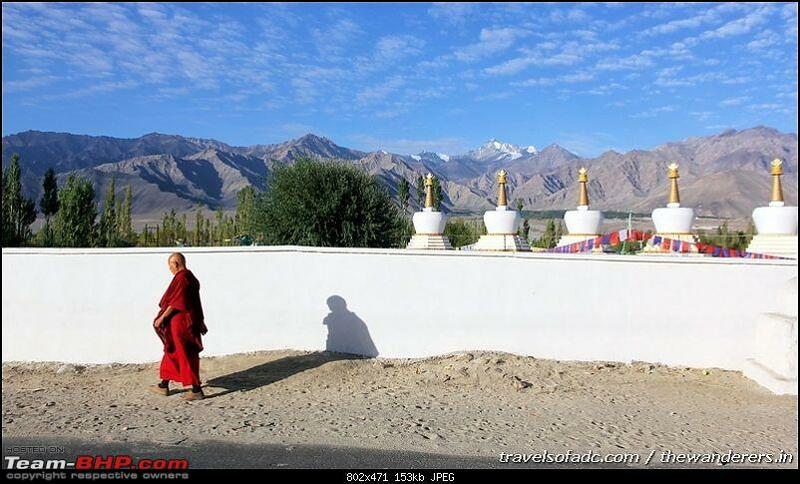 Ladakh, or La-Dags, the land of many passes, lies on the northern tip of India's frontiers with Pakistan and China. The region was formed some 50 million years ago by the collision of the Indian sub-continental tectonic plate with the Asian land mass. 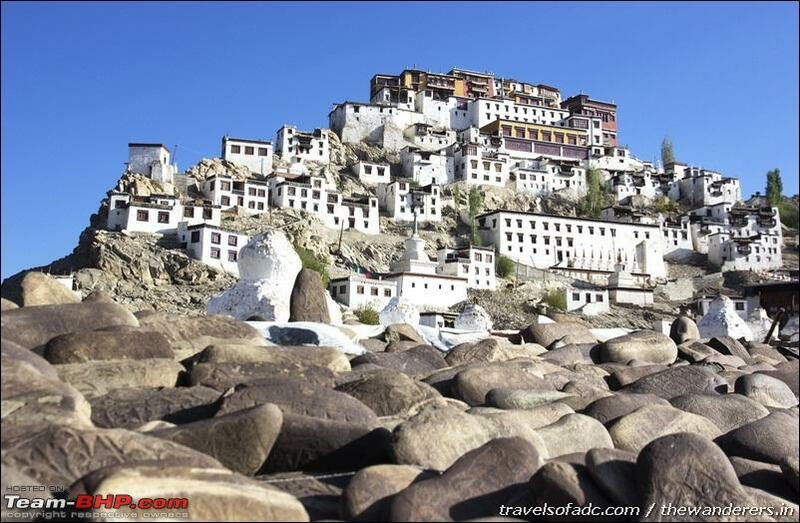 Cris-crossed by the four great mountain ranges of the Great Himalayas, the Zanskar, Ladakh and Karakoram, Ladakh is a vast expanse of uplifted high altitude desert, mostly devoid of vegetation, and sculpted over millennia into fantastic contours by erosion over the years. 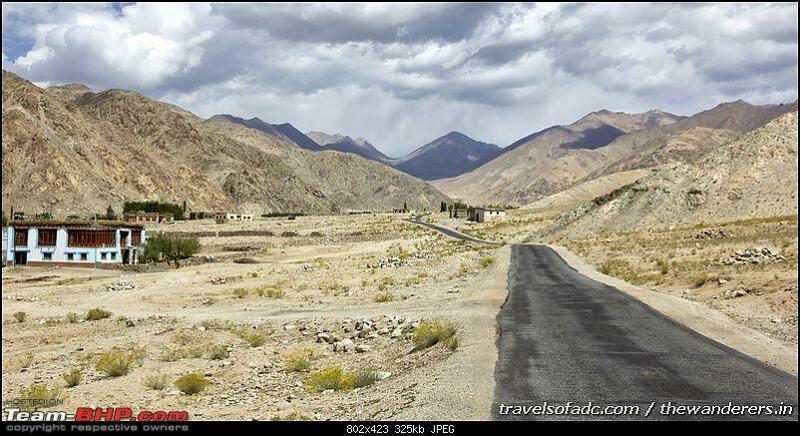 For us, ever since our Ladakh and Changthang self-drive by Magnificent Tourer [Safari Dicor 2.2] in 2010 - the region of Ladakh & Zanskar has beckoned each and every year thereafter. And as such just as memorable the October 2010 drive was [the highlight of the trip other than the usual being drive to Demchok on the Indo-Tibet border of China and seeing the River Indus just a narrow water stream entering from Tibet and also the experience that we had as we werel trapped out on the very top of Zojila for 36 hours, late October], so was the 2011 October trip to Zanskar and the most remote parts of Kashmir including the valleys of Bangus, Lolab and Gurez and of course the memorable journey via Margan Top to Warwan Valley and Inshan which in turn gave rise to that "Chap Rasta" video. 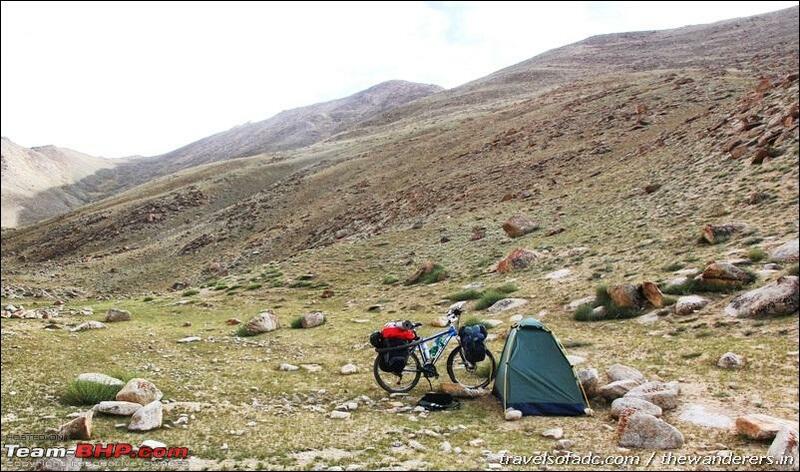 For 2013 ride the first initial plan was to bicycle along the Srinagar-Kargil route via Zojila and then on to Zanskar till Padum. 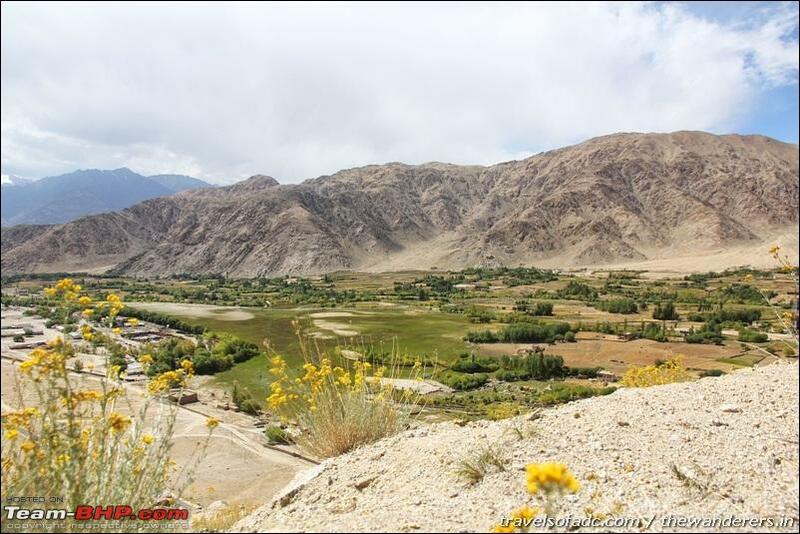 But the main incentive for doing that bicycling was to go from Padum on trek and a horseback journey in search of quite remote and very less known and photographed lake. 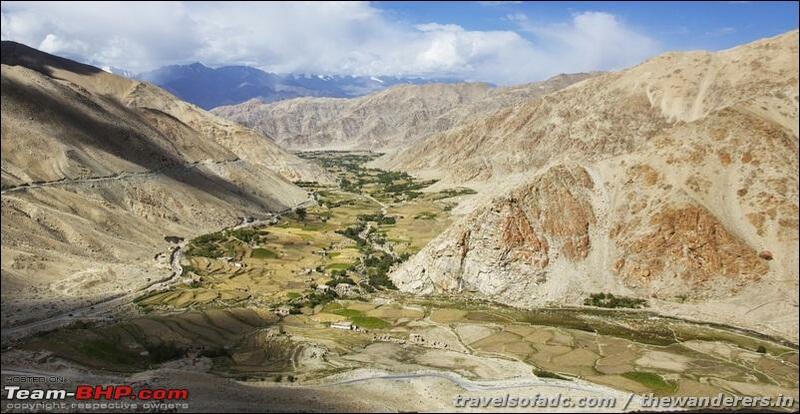 From there the plan was do a trek with the cycle on donkey back from Padum to Lamayuru. 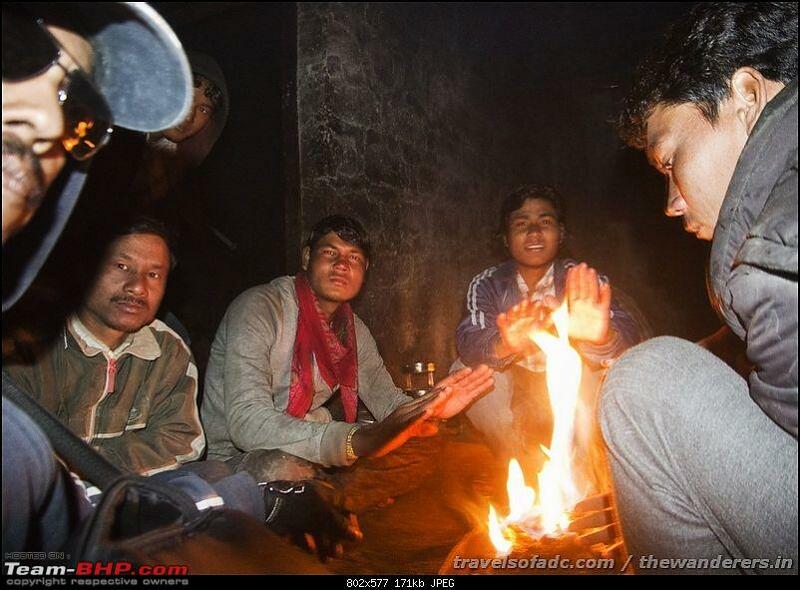 Both these journeys requiring horses/donkeys were quite exorbitantly pricey for me, particularly if I went solo, and as such was looking out for a trekking group from Padum with whom I can join with along with my cycle. A few came close to be finalized as also a traveller whose contact I got from Altitude Adventure, but then after much twists and turns neither of that came up to the final stage, and that is a different story by itself. 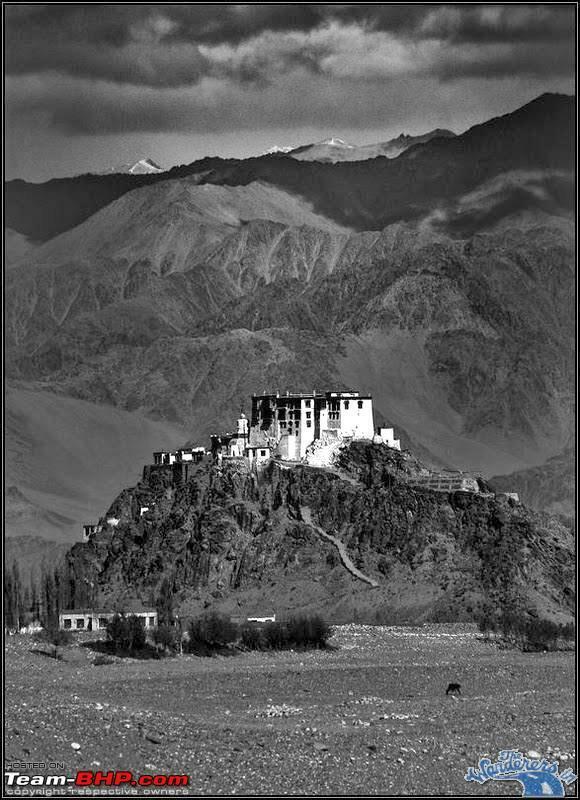 Anyway, that remote lake of Zanskar that I thought of going to was thus abandoned with great reluctance. The other option that was in my mind but not that much in the forefront was to go about on a big cycle journey along a circuit - a round about journey of 600 km that covers high-altitude Lakes and that first came to my notice by the groundbreaking freelance epic Ladakh map by one of great travellers out here in teambhp, Vardhan.harsh A very detailed one it showed for the first time the distances beyond Chusul towards Kakasang la and the subsequent connecting track between Chumur and Tso Moriri and of course also the adjoining lakes all around in these two most less mapped out area. 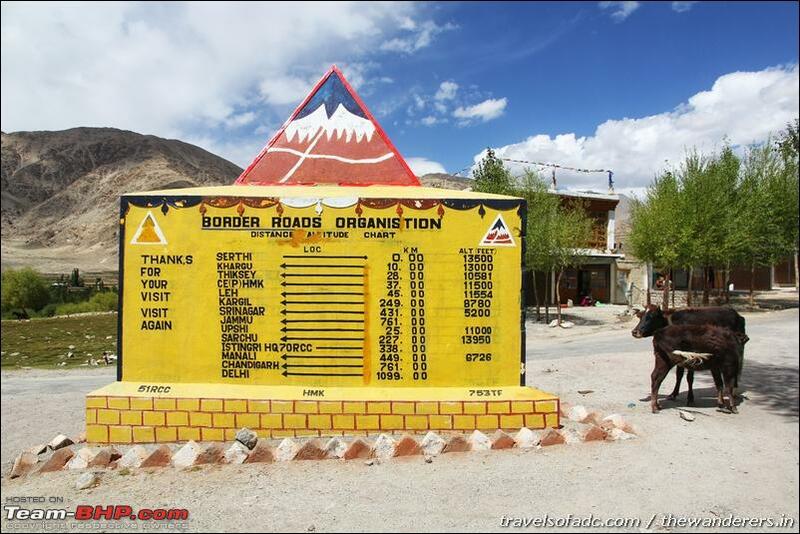 And then came tsk1979's [Tanveer] epic 2012 Leh travelogue and I would be surprised if there are still some bhipians who haven't gone through it till now! 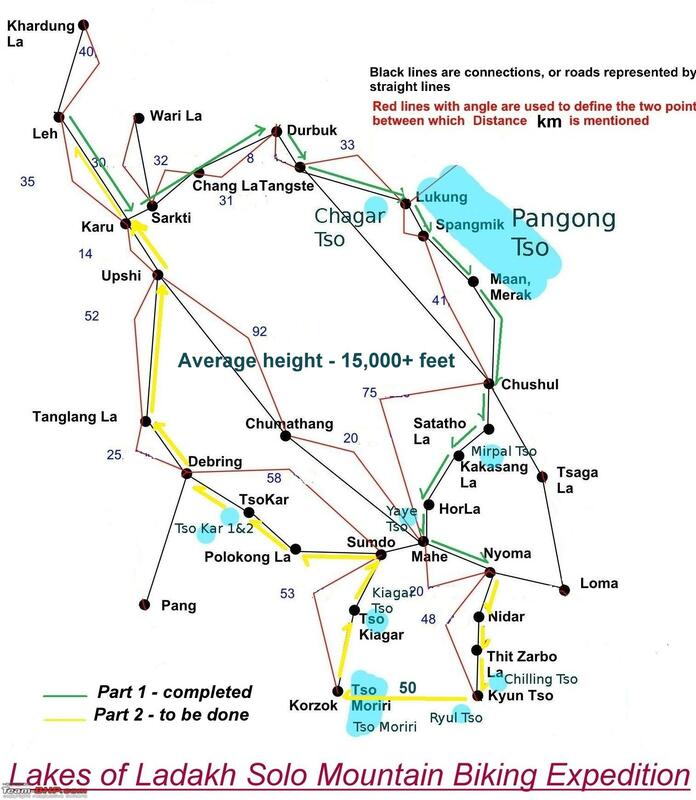 That trip gave rise to the best road and distance Ladakh map out here on the internet, the travelogue having almost all of my intended route including Kyun Tso I and II. 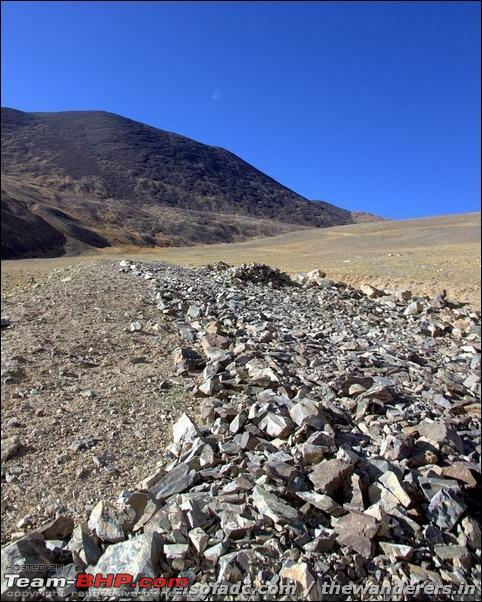 The only other part connecting Chumur cut off to Tso Moriri of around 50 km approx is left out in that travelogue but then as said, got that info from vardhan.harsh travelogue who has documented that particular journey. A whole lot of thanks to both of them, and that would include also for all the calls from DSPT of Chusul to Tanveer, trying to memorize and know more about the inclines and distances towards Kakasang la and beyond. 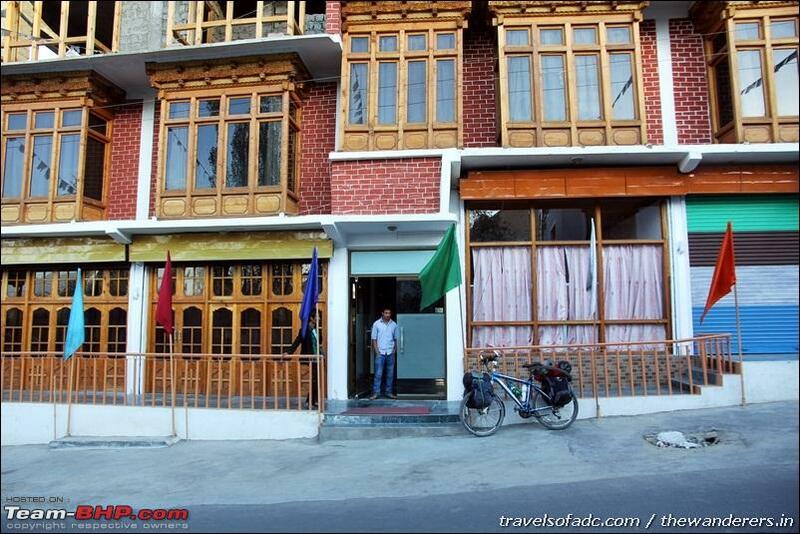 More about those phone talks that I had with Tanveer in Chusul later in the travelogue! And what a bicycle trip it was, though I could cover half of my intended travel -for reasons elaborated later, it still was a grand success. As for now let's begin with some highlight pictures of the varied experiences over the 2nd and 3rd week of September 2013. To the vast isolated stretches and expansive panoramas and vistas I crossed. Not a single soul crossed for hours and hours, more so as it was around the cold mid-September season. To the most unlikely places stayed and the welcome I got from all folks that I met out there. For the first time ever a bicycle on the route beyond Chusual, up on to Kakasang la and Hor la while covering lakes as Mirpal and Yaye Tso. From metal to dirt to boulder stony tracks, Trek 4300D Mountain Knight took all it in stride. 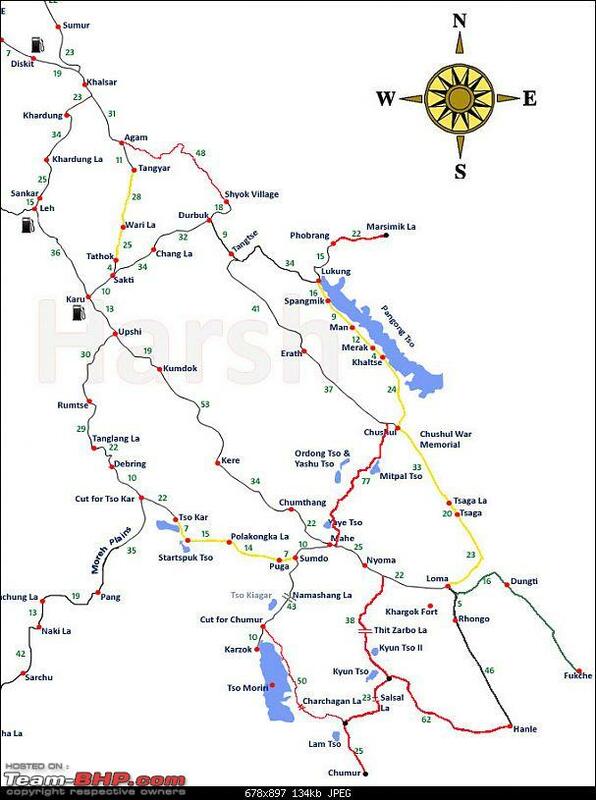 Have cropped and modified a bit that brilliant map of Tanveer to remove the vehicular time. 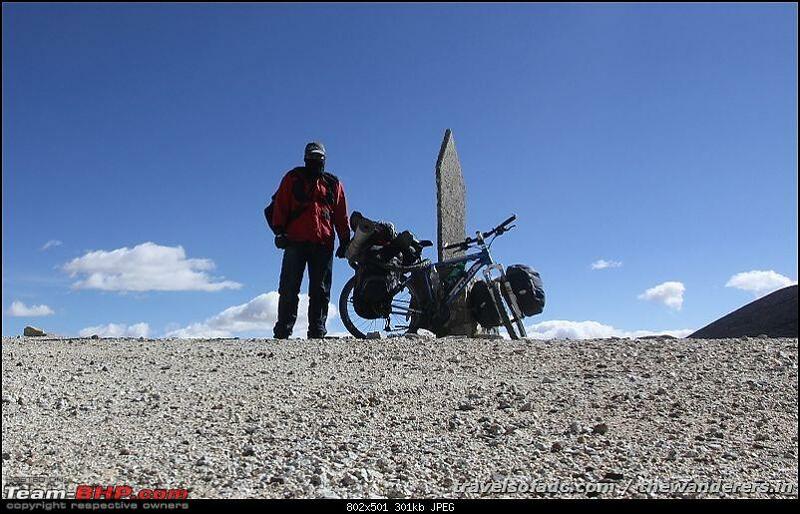 The total intended journey was around 600 km of which around 300 km was done, and thus has been classified as Part 1. The rest, as marked in Yellow, will be done sometime next. This is the Vardhan.harsh map, - the first ever groundbreaking freelance epic Ladakh map showing Kakasang la and Hor la as well as the connecting distance between Chumur cut off and Tso moriri via Charchagan la. 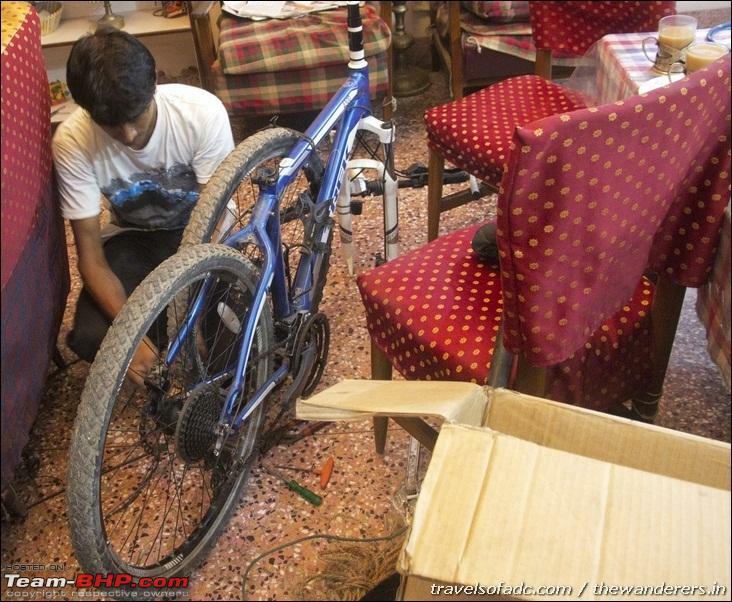 Days A, B and C: Connecting flights from Kolkata to Leh via Delhi with bicycle dismantled and packed in the bike box, and then another couple of days or so of acclimatization at Leh. Second time in my 41 years of life with the intention of bicycling 600 km in these rarefied high altitude mountain ranges, on a gloriously clear yet cold September month, I venture out for the lesser known and the unknown. 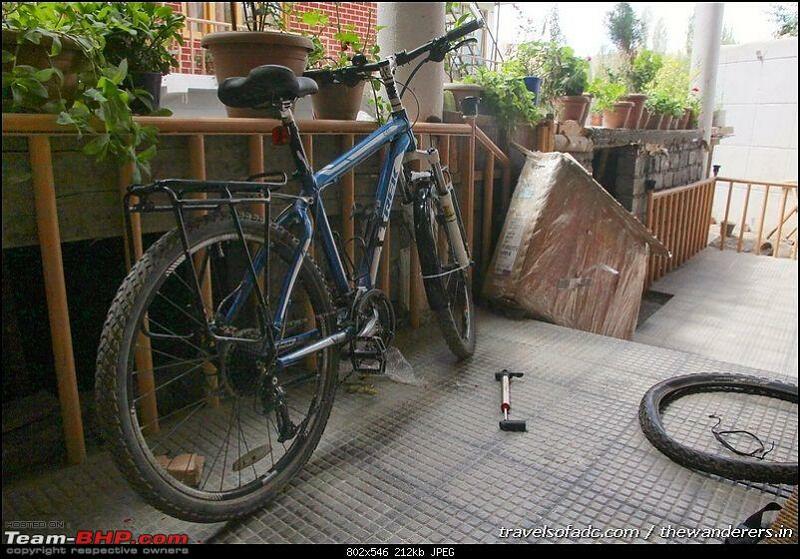 Bicycle just as loaded as was on the Manali - Leh journey. A gradual downhill to Karu junction, from where the left uphill road starts. 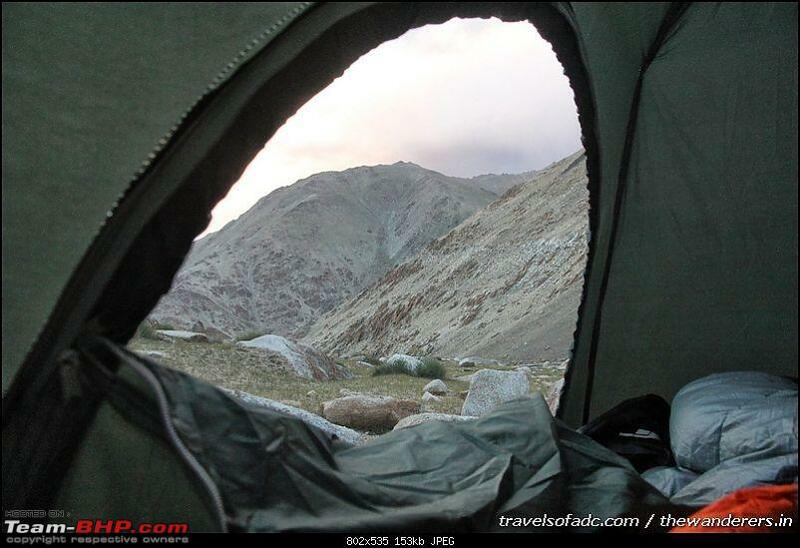 Cross Sarkti with an aim to camp and spend the night in the camp on the mountain side. But then something happens as dusk falls, and I realize that my solo adventure just got a huge jump start. 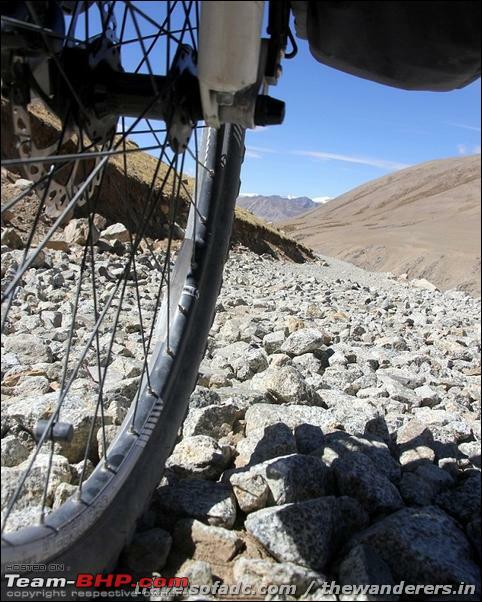 The inclines are now that started after Karu has gone brutal by the turns as I bicycle towards the first high mountain pass of Mighty Chang la [5360m or 17,590 ft] en route towards Pangong Tso. 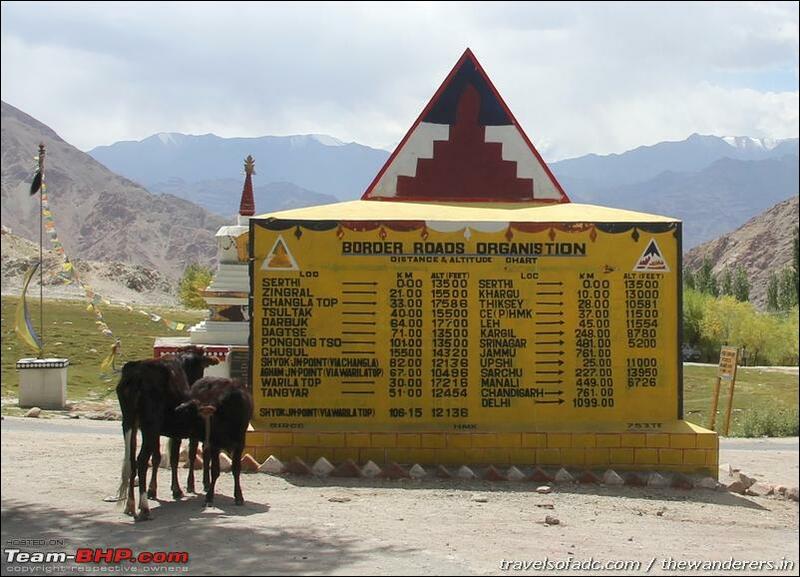 Stop at Zingral, an nondescript Army forward camp, but then again similar to the previous day ending was eventful, this too did not disappoint. From Zingral the inclines just seemed to get even more steeper before I stumble on to the top of a bitterly cold Chang la in the 2nd week of September. The first pass of the trip is crossed and of course then comes the massive downhill all the way to Darbuk. Continue another 6 km on the more or less flat road towards Tangste for a night halt. No major surprise on the place of halt unlike the previous two days. Stay at an absolutely new massive hotel got at a massive discount at this off season time. 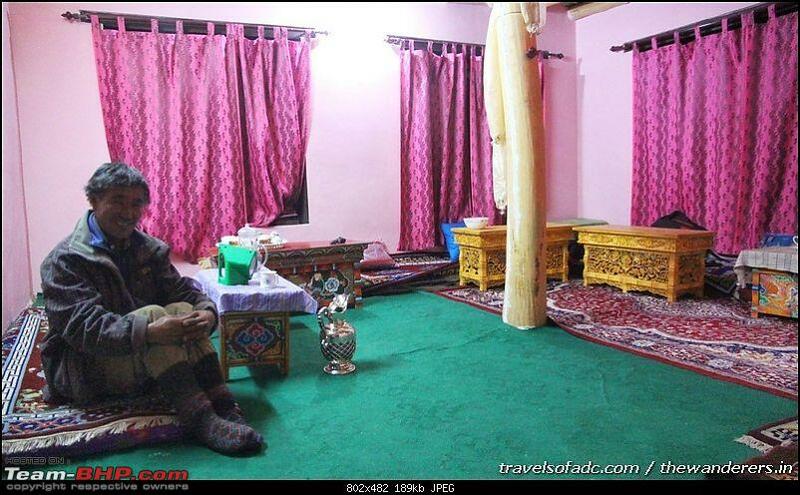 I am the only guest in the multi-room hotel. 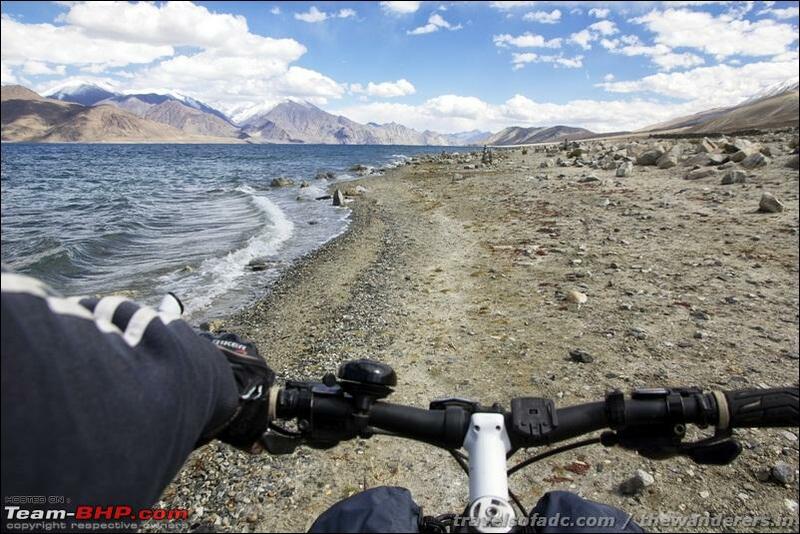 Chagar Tso, the small yet beautiful lake, is the first high altitude lake in this Lakes of Ladakh bicycle ride. 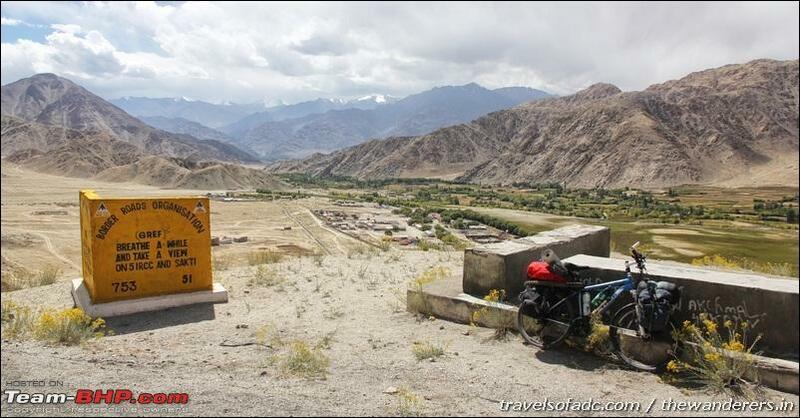 A fulfilling halt here for sometime and then slowly and surely I move forward along the undulating metaled road towards Pangong. 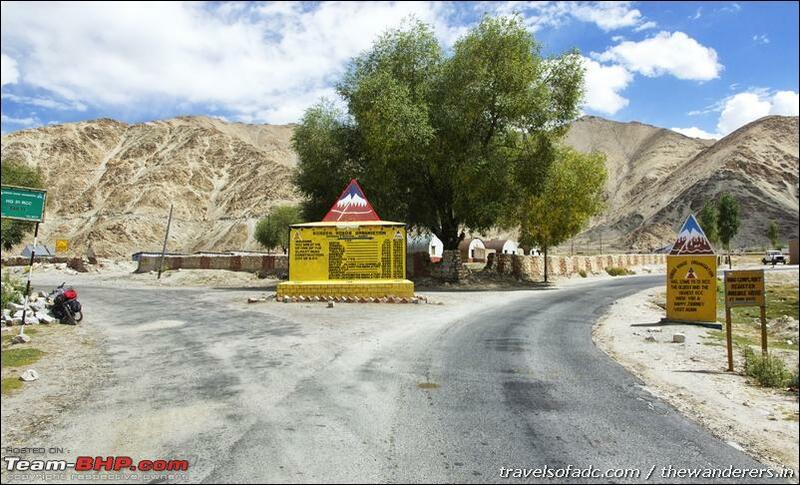 Stay at Lukung, the first village from where Pangong Tso is accessible from the Indian side. 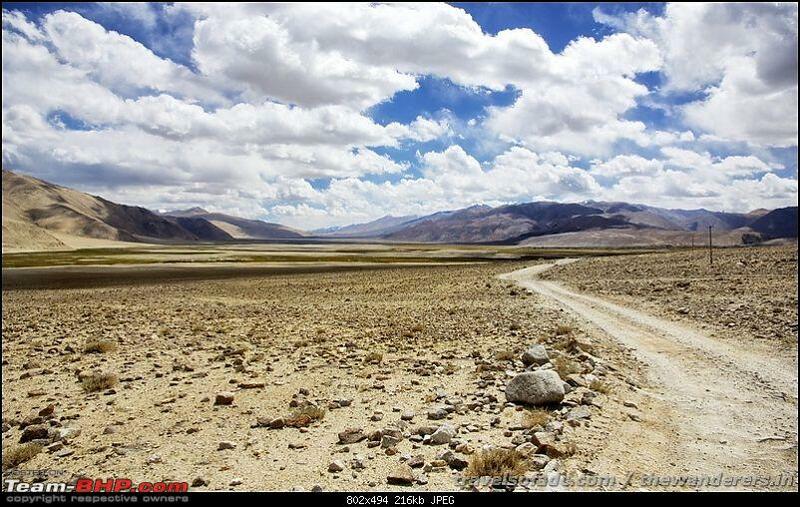 It was back in October 2010 that we were on this same very track with our Safari Dicor during that fantastic Ladakh journey. But then that was a drive on 2.2 litre CRDE 140 bhp vehicle. 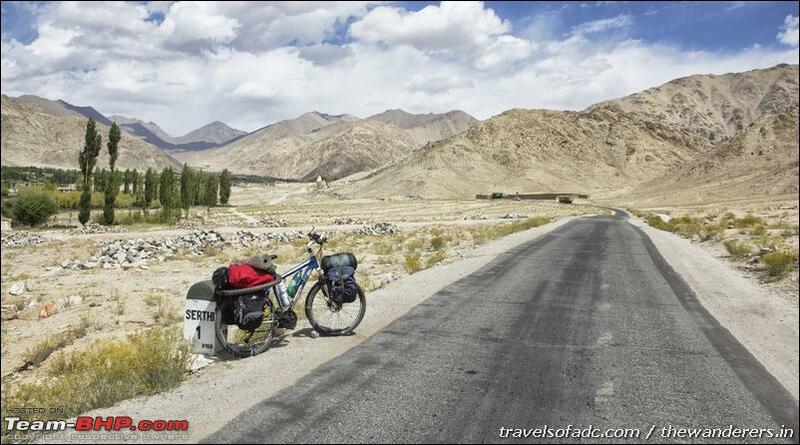 Back to September 2013, solo on a bicycle, I had pre-planned this to prolong as long as possible - Only 16 km covered but then enjoy each and every moment as I cycle slowly along the shore of Pangong. What an experience! Just 21 odd km of cycling, but then, as said, I had every intention in prolonging the bicycling experience on this most magnificent high altitude lake. 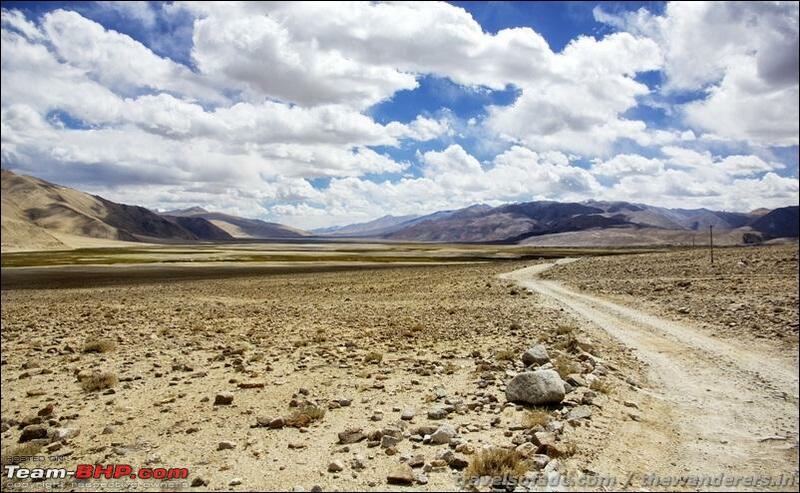 A goodbye to Pangong Tso midway between Merak and Chusul on a absolutely desolate dirt track in mid September. Uncertainty is back with vengeance and the trip almost gets cancelled. But somehow someone just about salvages the ride and I just cannot thank him enough for all the help and support. More about it later! 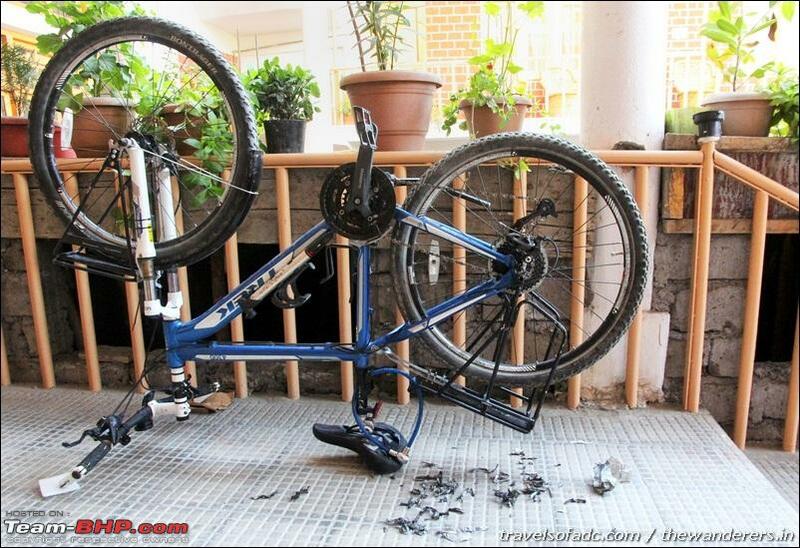 The most eventful day, the bike ride is somehow salvaged. 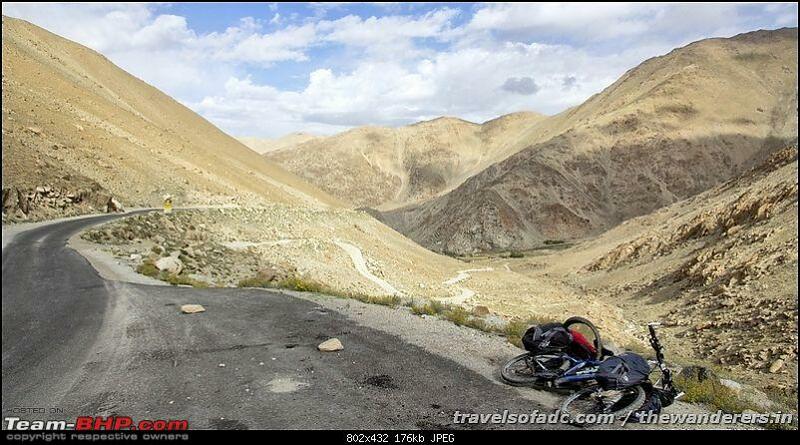 An assisted stealth operation at the crack of dawn finds him bicycling again some part of the brutal incline to Kakasang la [a pass higher than Khardung la]. First time a cyclist and his cycle is on top of Kakasang la, brilliant the experience and moment. 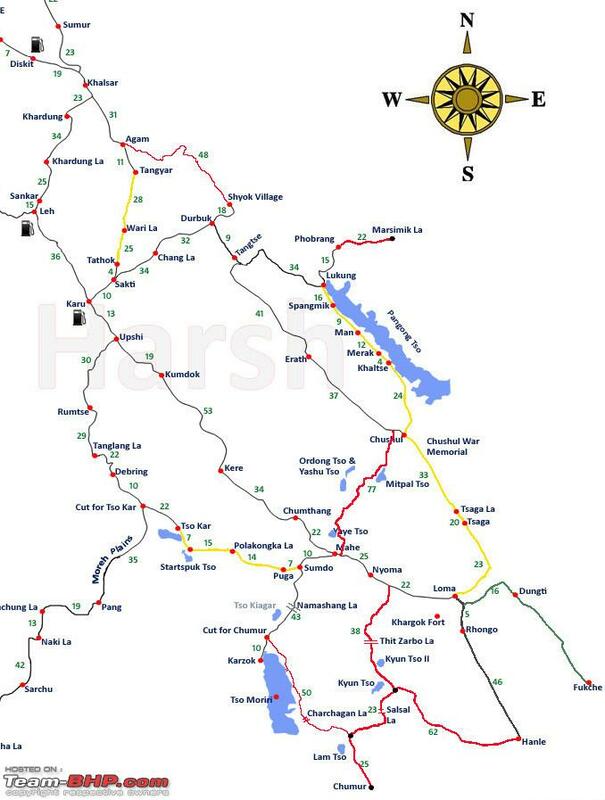 And then a short downhill to start again the incline to Hor la. That done in absolute wilderness at this rarefied cold atmosphere. 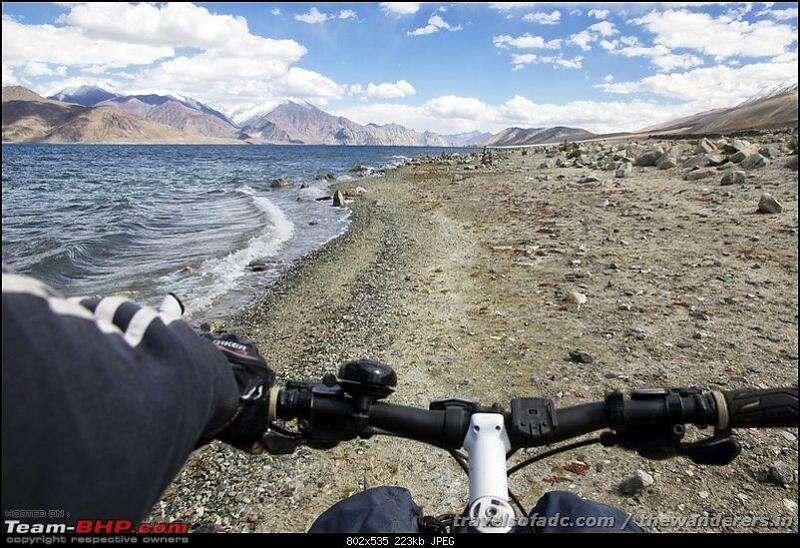 Then again a massive downhill but not before crossing the 4th Lake on this wonderful Lake of Ladakh bicycle expedition. 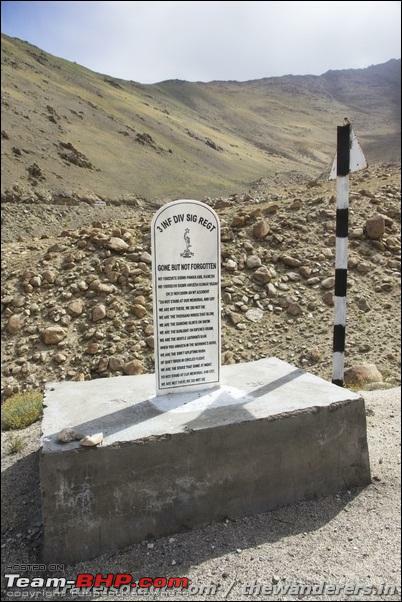 Connect to a metal road [Leh-Nyoma road] at Mahe. Night stop with an most wonderful couple at Nyoma. The experiences do not end here though, great to I find myself in a middle of festival and feast on that very day itself at Nyoma village. Day Y: Abrupt ending of trip - back to Leh on a truck. 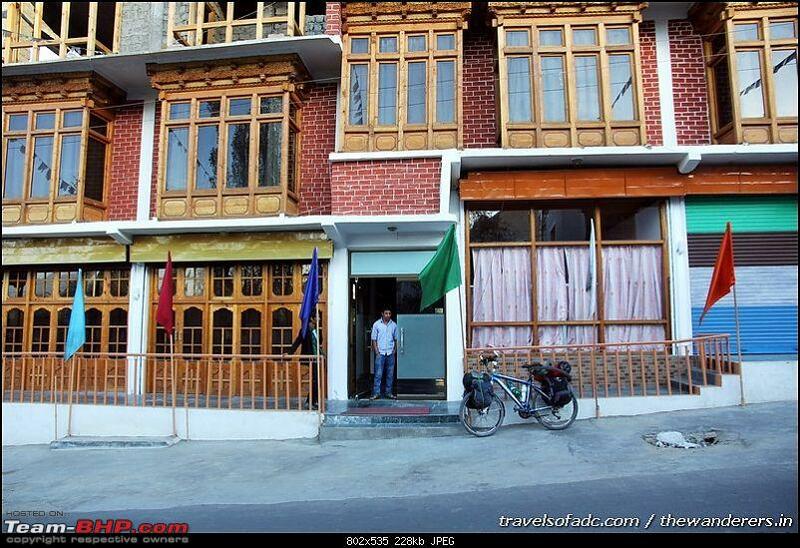 The same evening, on a shared taxi for a non-stop run from Leh to Srinagar to catch a flight. The last mobile connection was way back at Karu and the again for a few hours in Tangste. As I descend on to Nyoma and get the first BSNL mobile signal somewhere in Mahe, I get a frantic call back from one of my friend who was just about managing some part of my work. Being a freelancer, a loss of work is a huge blow - when I travel in remote areas some of my good friends manage my accounts. But this time the situation was beyond control - the summary of the phone call is this - I have to be back in Kolkata in less than 48 hours, back at the desktop to salvage and thus be able to work for another day! 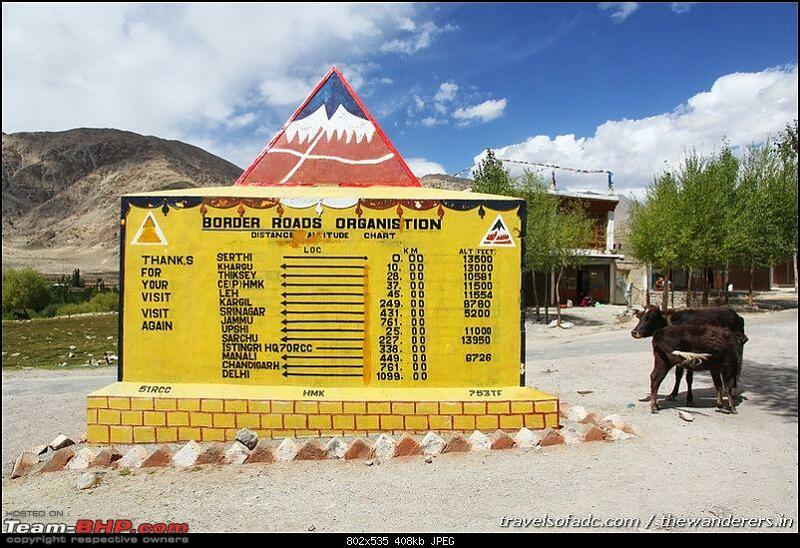 As such ended up getting onto a truck going to Leh from Nyoma and that very night on a shared Innova taxi for a cannonball run to Srinagar. 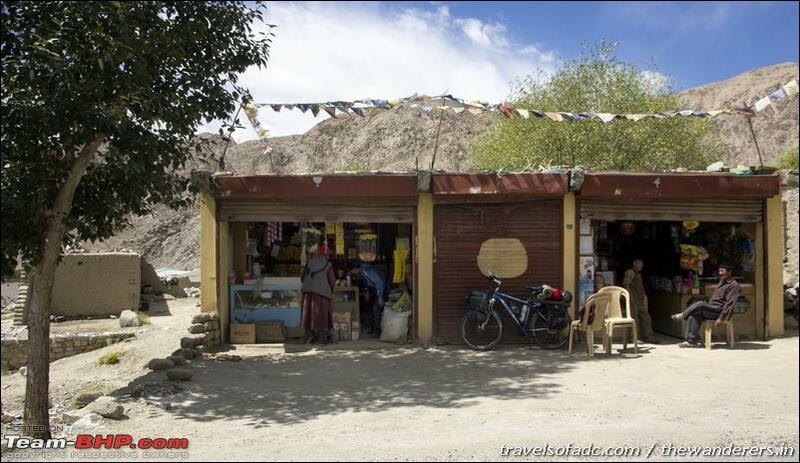 As for the bicycle it is left out in Leh [!] 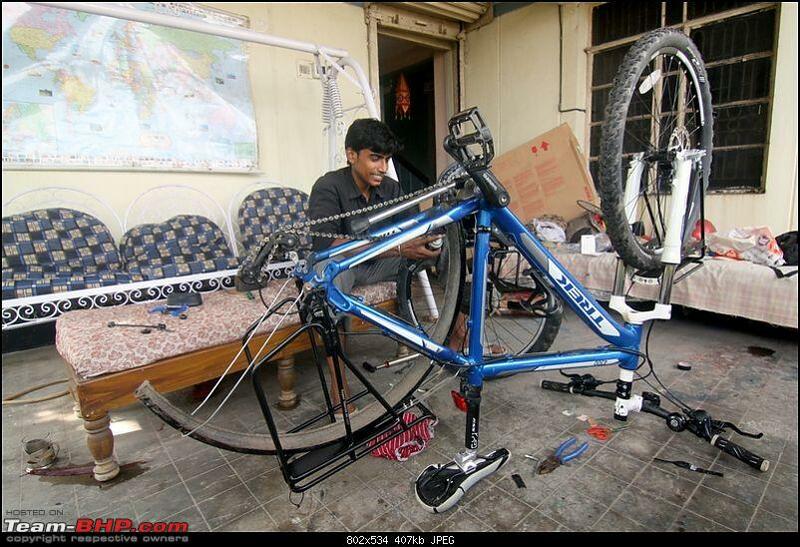 n the storeroom of Abdul Qayoom, there is no time to pack and plan on how to bring back the bicycle! Day Z - Overnight cannon ball run on an Innova taxi, leaving Leh in the evening to arrive at Srinagar early morning. Catch a flight from Srinagar to Delhi and then a connecting flight to Kolkata. Back in Kolkata in just about 24 hours since that phone call from Nyoma, back to my desktop - I survive to work and travel for another time and day! 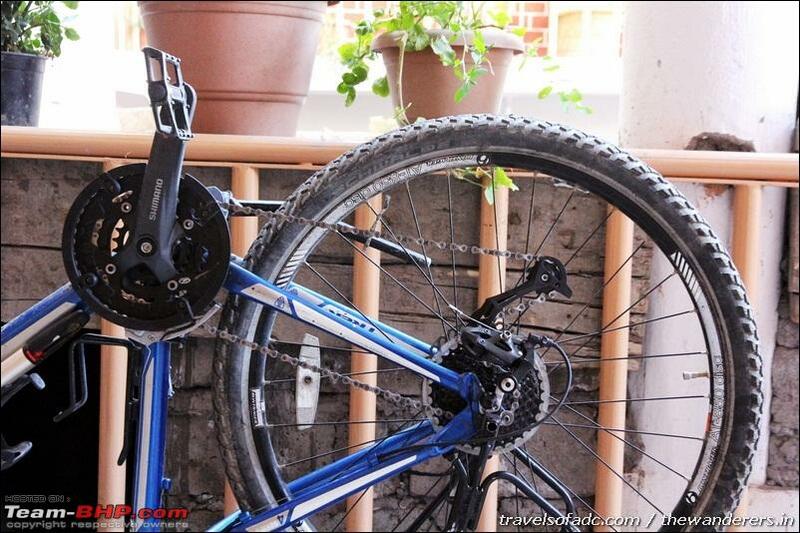 The Trek4300D bicycle itself was costly for me, it is almost at the price of a entry level 100 cc motorcycle - and as such bought through credit card and the payment was promptly broken up in 12 monthly installments. Moreover since my intended use is still only for long distance touring on the hills, I opted for hydraulic disc brakes which again added some 8-9k to the cost. Most crucial parts for these kind of bikes most probably still comes through import and as such the price also reflects that. 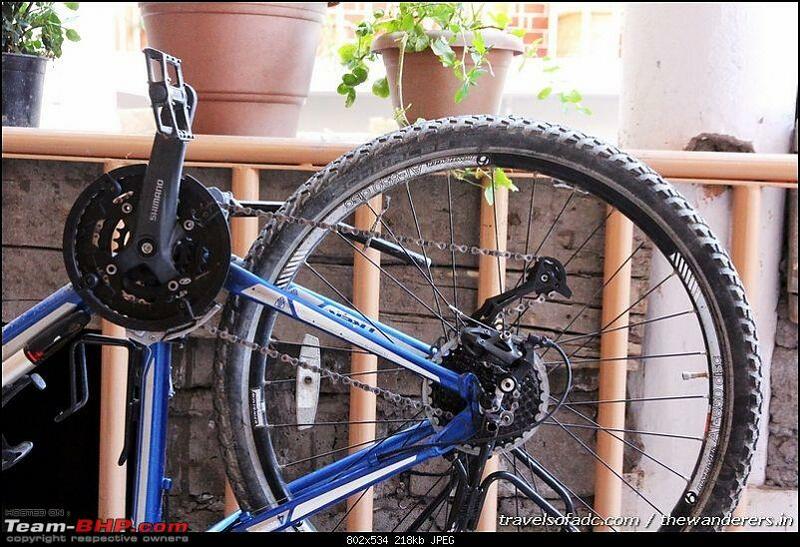 Each tyre cost close to Rs 2000, chain most probably similar or more - and then there are all those various bearings and wear of brake pads and chain links. All these costs are my approx figures and I have a suspicion that in fact the price is more. 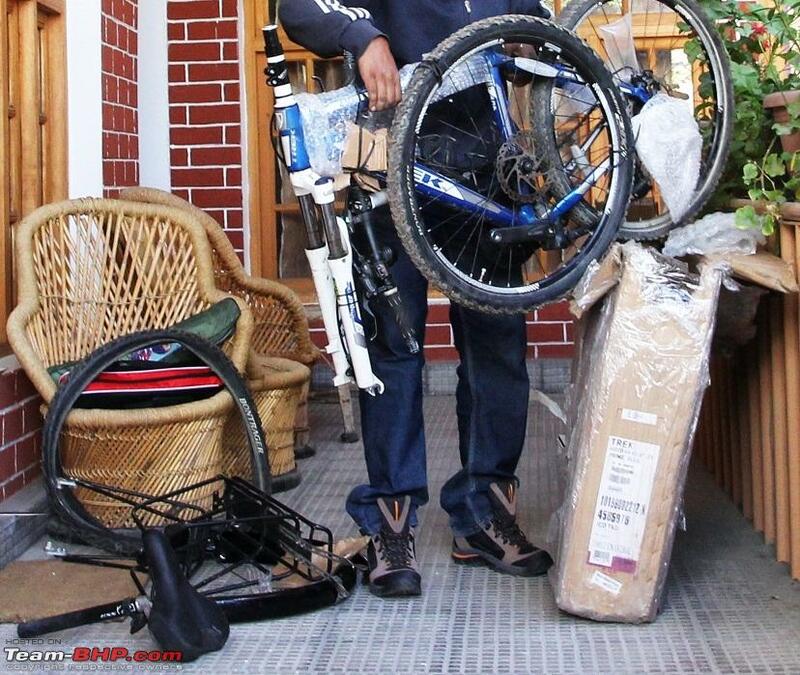 Similar to last year, my local tech, Mr Someshwar Rao, out here in Kolkata, drops in a week before - to go through the steps in dismantlling, boxing as well as re-assembly of the bicycle as I would be doing all those in this trip as I carry the bicycle on flight. ..and one would recall his tech tutorial from last year, where he updated me on maintenance front. 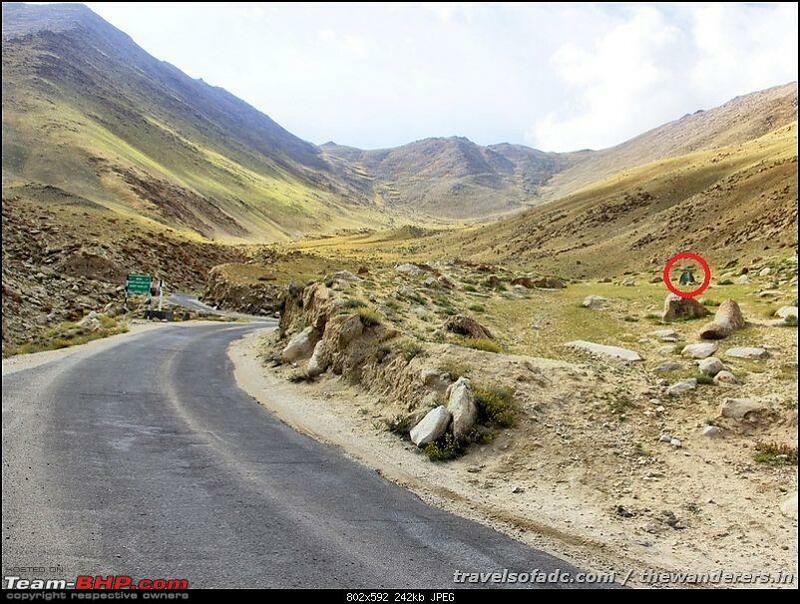 Seen here in 2012, from the Manali-Leh travelogue. 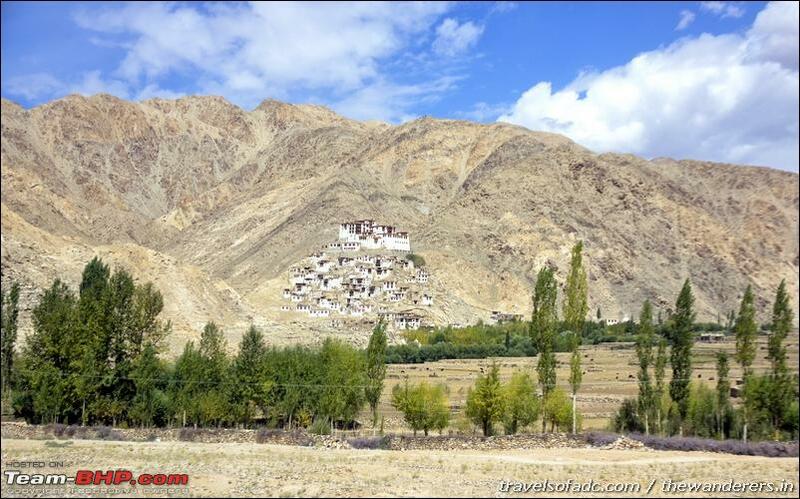 The months of September and October, the "off-season" tourist months, have always been the favourite time for Ladakh travel, as can be seen from our past travels, whether it be on a family drive or solo journeys. 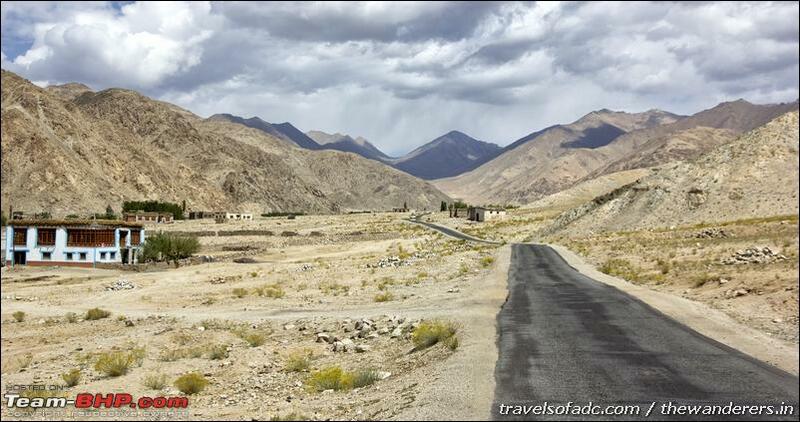 The tourist season has ended, people are more relaxed, hotel room rates have moderated quite a bit, and of course the remoteness of Ladakh is much more accentuated with far lesser people around as the travel season comes to an end. 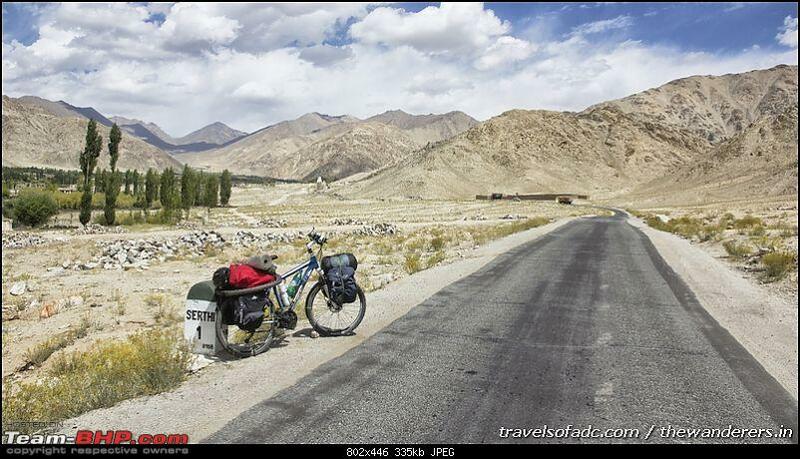 This was a big unknown journey on bicycle, particularly after Pangong, as such the first week of September 2013 was when I planned to start. 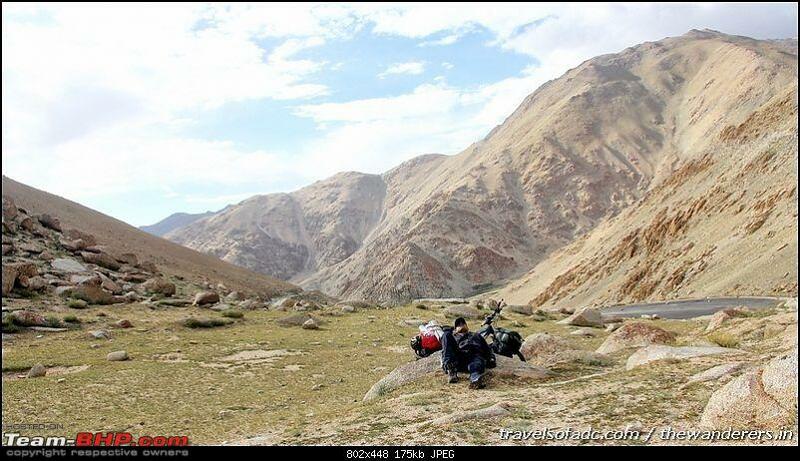 Work situation was tight and hence did not want to spend some 3 days on trains and buses travelling from Kolkata to Leh. 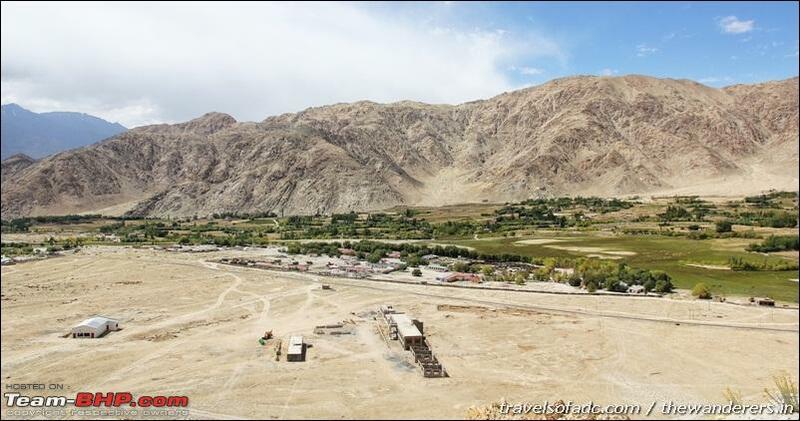 A chance search on web landed me a really good bargain airfare, connecting tickets - from Kolkata to New Delhi by an evening flight and then overnight at T2 airport for an early morning flight from Delhi to Leh. 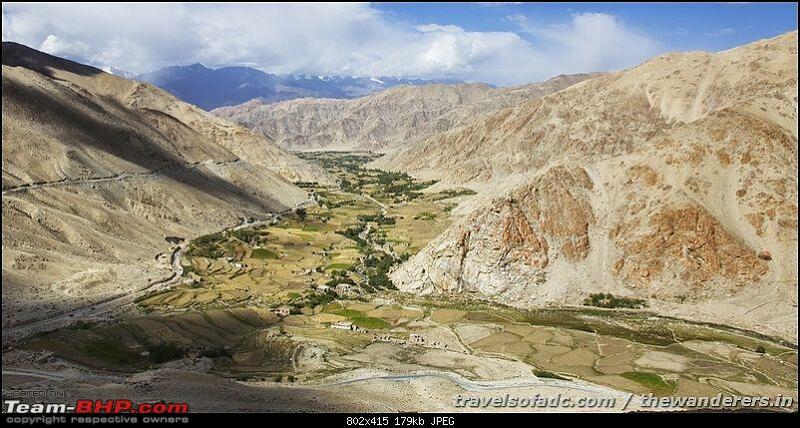 So unlike last time, I am going to reach Leh from Kolkata in less than 24 hours. Transporting a bicycle on airlines: "The bicycle must be packed in a bike box or protective packaging. 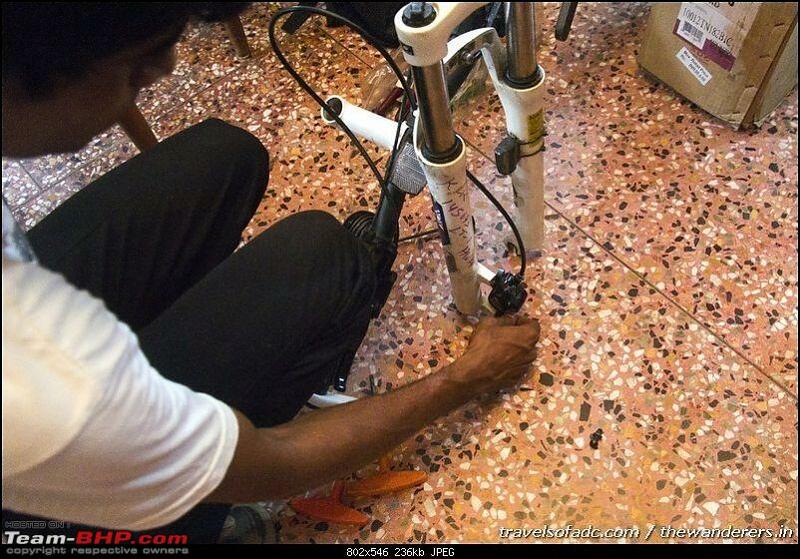 The handle and bars must be turned sideways and the pedals detached. Bicycles are charged as extra if the 2 piece concept is applicable. In the weight concept, we do not have any separate charge for bicycles and will charge excess baggage above the free baggage allowance." -- From Jetairways website. 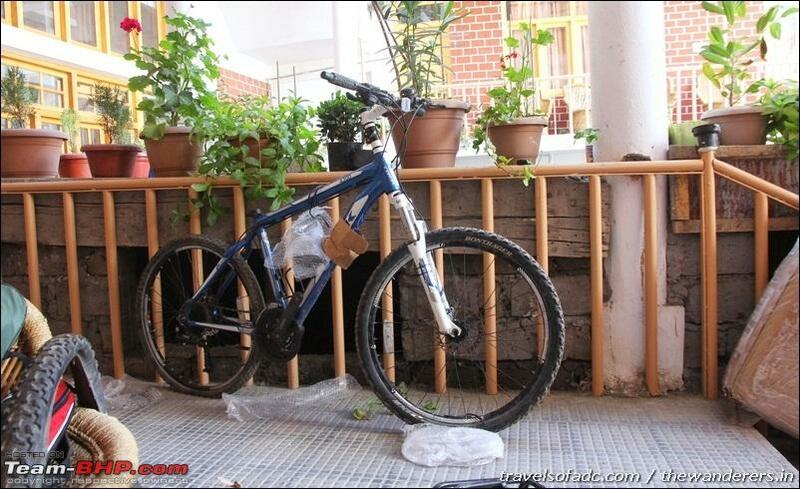 As such, the bicycle was dissembled and packed out in its original box that it came with. 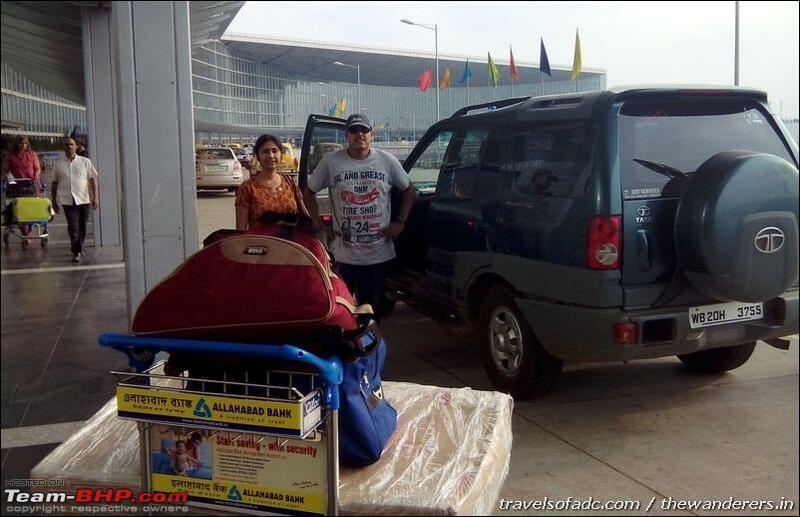 September 4, 2013: Our Safari Dicor VTT Tourer even had a small part in this travel to start with, dropped me at the airport along with the bicycle packed in its box. Again as has been on my solo rides, whether it be on the Bullet or bicycle, without Asmita and my son's support, none would have come through. 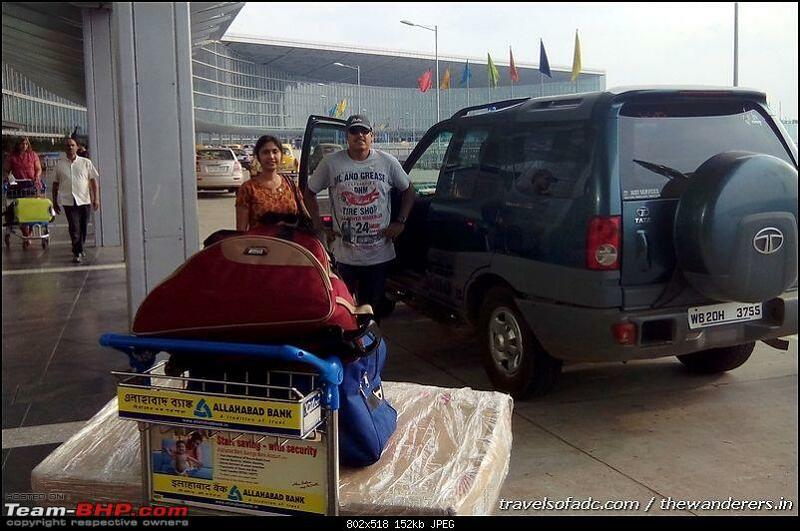 A bye to them, evening of September 4, 2013, at Kolkata airport for the flight to Delhi. A uneventful late evening 2-hour flight to Delhi and overnight at the T2 airport to catch the connecting early morning Jetairways flight to Leh. 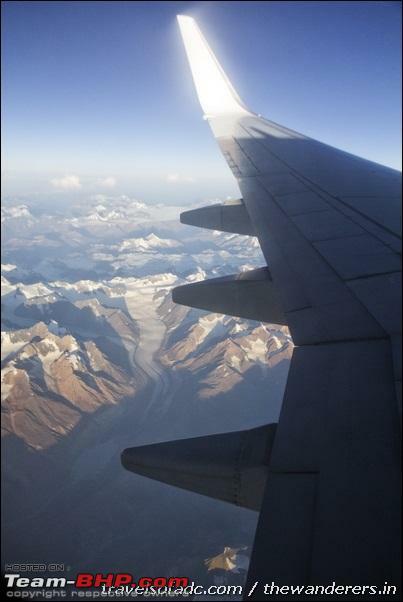 Great views on a crystal clear day as the flight crosses from the plains to the high mountain ranges of Ladakh. 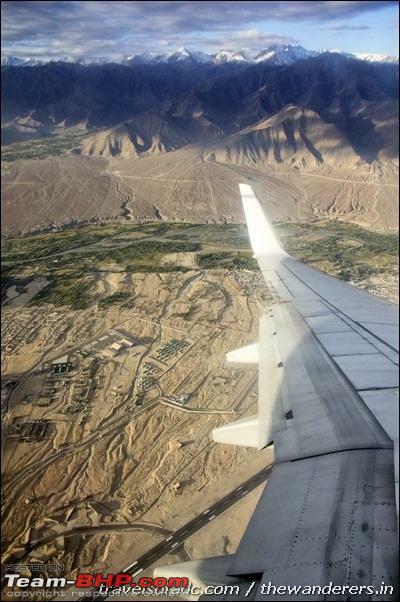 The landing at Leh is always an elaborate one, circling to get the exact descent point on to the runway. Checked in to our favourite hotel since the Safari drive travel of 2010, Hotel Shanthi Palace located at Old Sheynam Road. Again start of off-season and I get a decent room at 1/3rd its rated price. 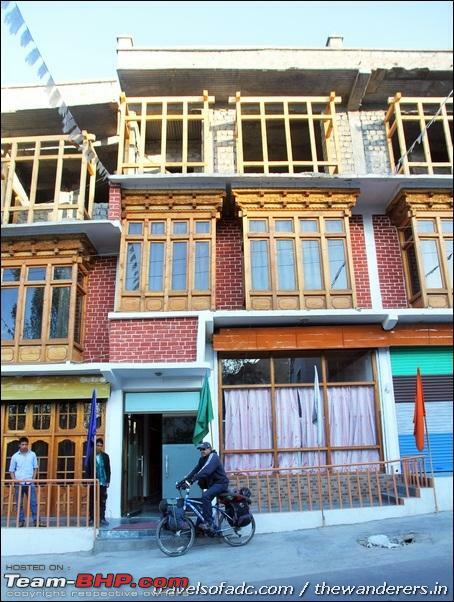 Else would have gone towards the Changspa side for the innumerable budget guest houses. 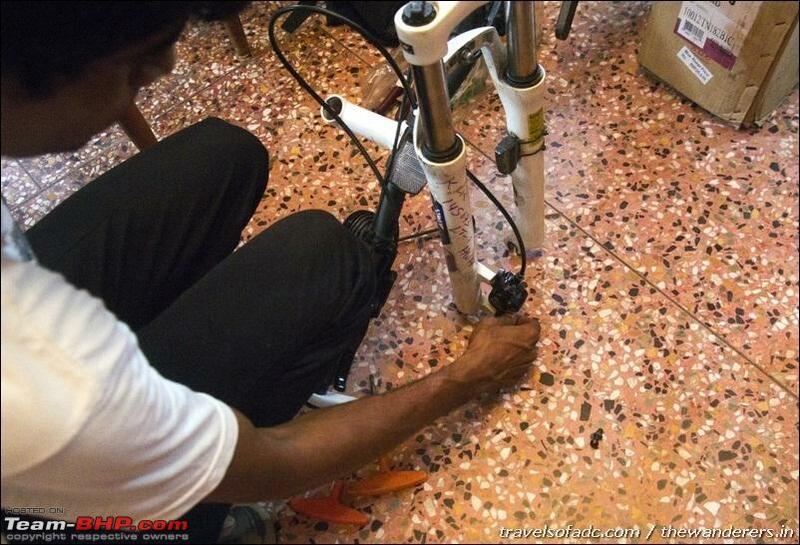 A brief rest, breakfast and chai break, and it was back to reassembling the bicycle, lest I forget what I was taught a week before!! And it was a relief to get it all again back together, most crucially that too a functioning one! The next 2 days was just acclimatization, managing the work situation before I go off the grid. 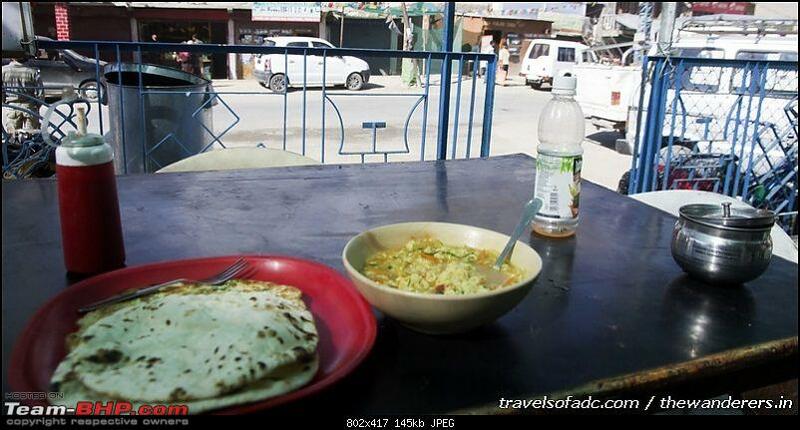 By now I am quite familiar with all of the bylanes of Leh market - one does get some great food if you know the joint - hotel accommodation may be okay - food is still costly, and I am on a tight budget for this trip. Seen here at a tea shop [named after Kargil war peak Tolloling] of Leh market. Here I met Mr Abdul Qayoom of Altitude Adventure, who has been very much instrumental in that Stok Kangri ascent logistics during the last year's bicycle trip. And moreover, I had something special to discuss with him for an upcoming "wacky" plan January 2014, but then more about it later in some other post or thread. 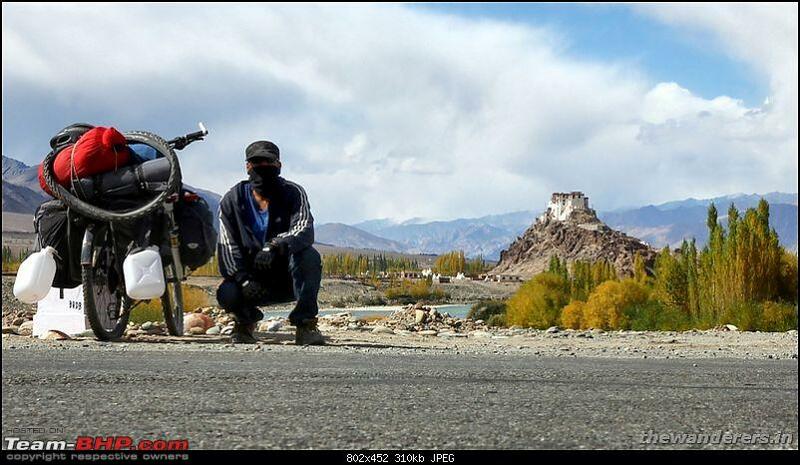 September 9, 2013, is the day I am ready to embark on this intended 600 km trip - a bicycle ride that would take me on huge circuit covering the 10 lakes of Ladakh. 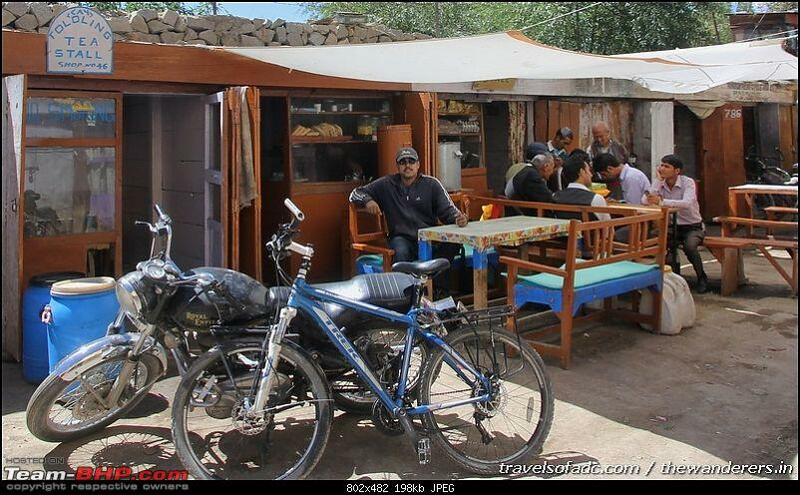 Early morning strong tea and by 7 am, start from Leh with the first intended breakfast stop to be done at Karu, from where I would branch off towards Pangong. 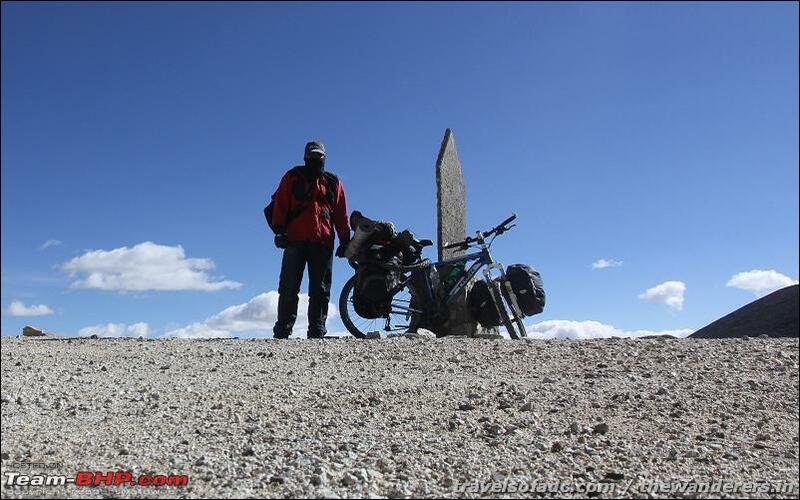 As I start on this off-season, 2nd week of September cold month, the only thing I was certain of was that this would be a one big lonely trip - a ride that would cover some passes and lakes first time ever done with a bicycle. A picture by the hotel guy and off I go. Leh beautifully empty as I enjoy the early morning - great to be back on the bicycle after almost an year or so. It is more or less undulating downhill from here till Karu, before I turn left towards Pangong for the inclines to start towards Chang la. 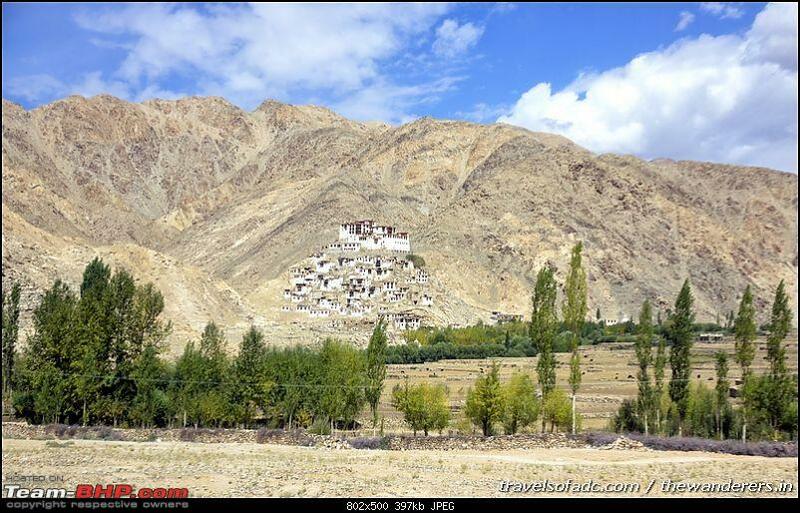 Soon also comes Shey Monastery. Shey Palace and chortens as seen from the road. That done back to bicycling along the Leh Manali highway. The magnificent Stakna monastery comes next to the right. 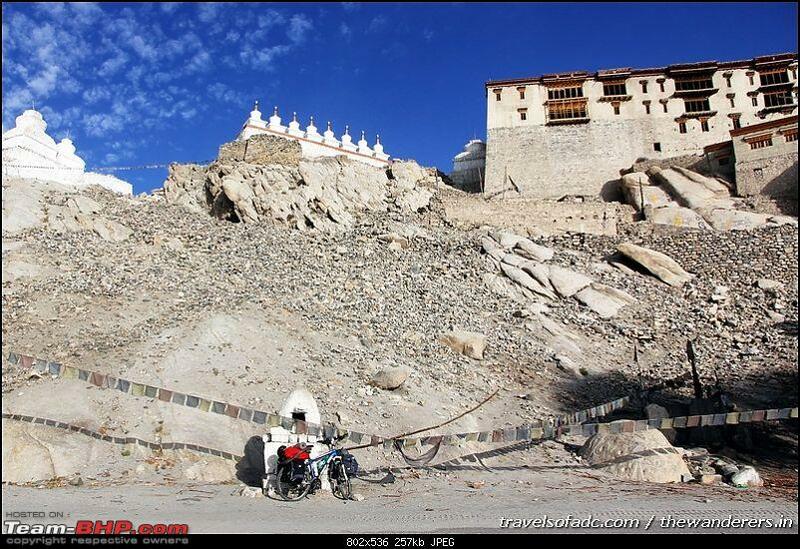 Did not stop out here as some time was "lost" during those previous two monastery breaks plus had no idea about where I am going to halt or what to expect from the inclines that start from Karu. 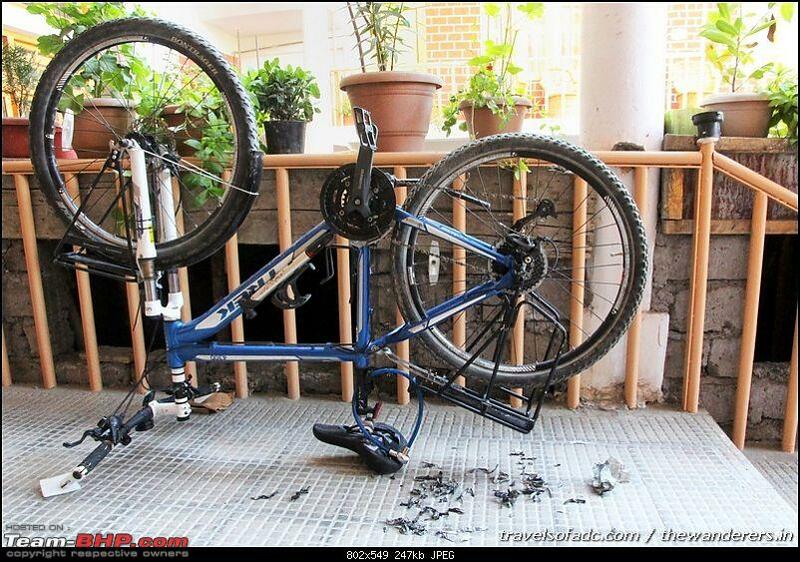 And also have quite a bit of "acceptable" images from my past journeys including the last bicycle trip. Here are few of those from previous years. 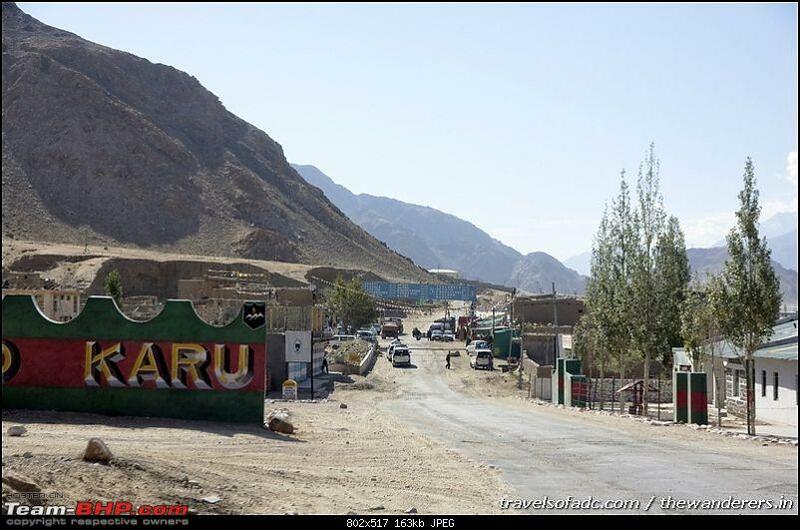 Some 30-32 km from Leh, is Karu. From here the inclines will start as the road to Pangong Tso branches out from Karu on the Leh-Manali highway. 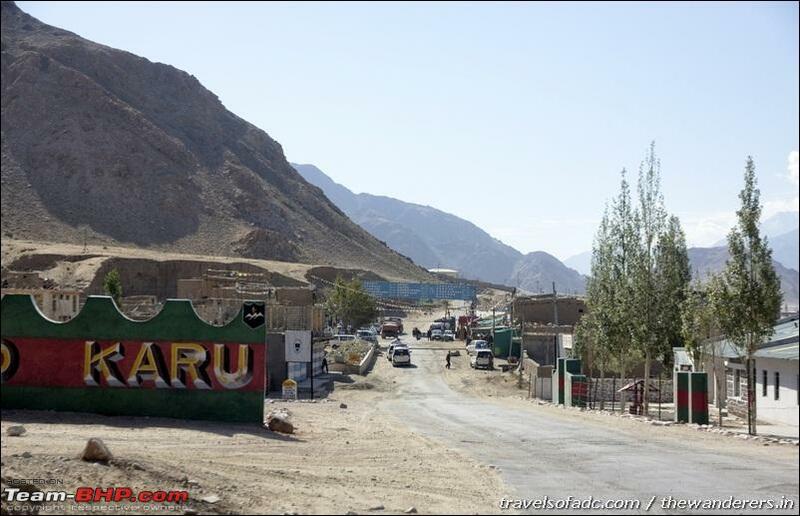 Like its much more famous sibling [i.e., the last petrol pump at Tandi on the Manali-Leh highway], Karu petrol station also has the signage as being the last filling station on Leh side. 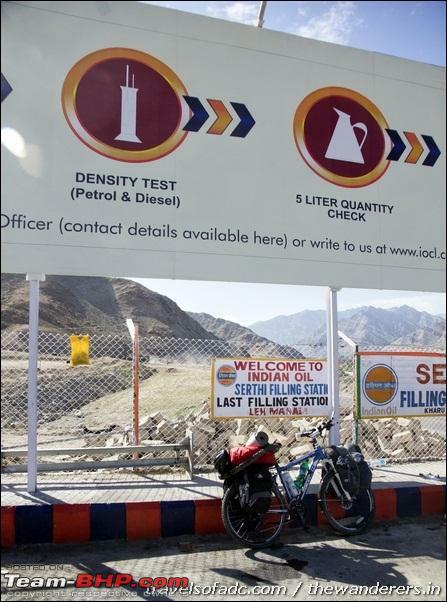 But then most of us who have driven fill it up at the petrol pump of Leh roundabout [can vouch for its quality] and hence this is missed out - but then not on a bicycle! 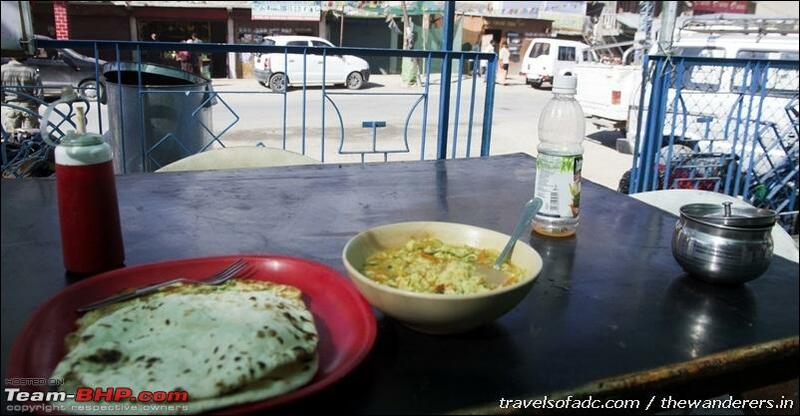 Breakfast at Karu roadside shop. A bit more than what was needed as I had no definite plan of as to where to stop - just thought of cycling and covering as possible before dusk sets in. 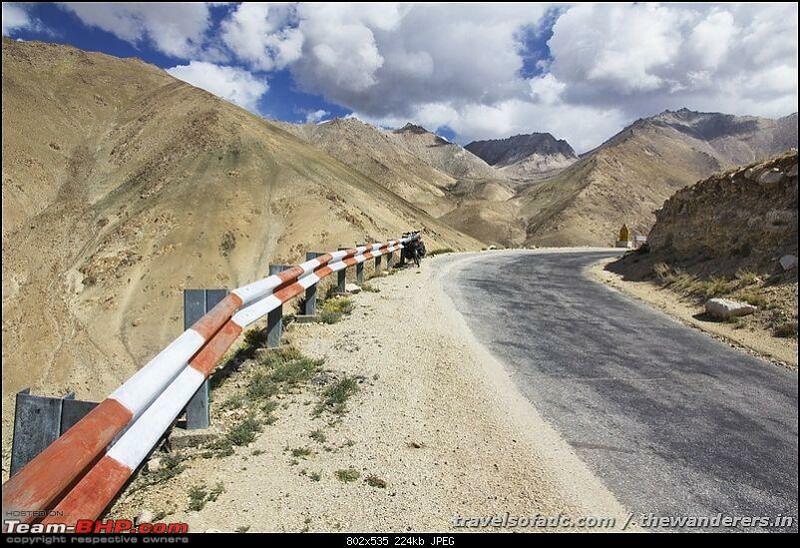 Off on to the Pangong road now and inclines start from here and would continue all the way to the top of the high altitude pass of Chang la. 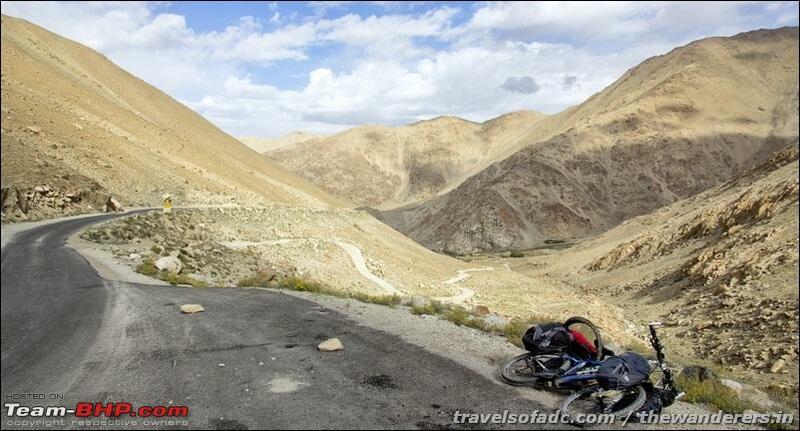 As I now cycle slowly, the road is quite empty now other than a few taxis that rush towards Pangong. But the scenery and the panoramic vista absolutely enchanting. The first small village that comes up 10 km after Karu junction is Sarthi/Serthi/Sakti. The expanding panorama compels me again to stop and click. Stop by the only shop at Serthi, stock up with some maggi noodles and juice for night - just in case I planned to camp out. 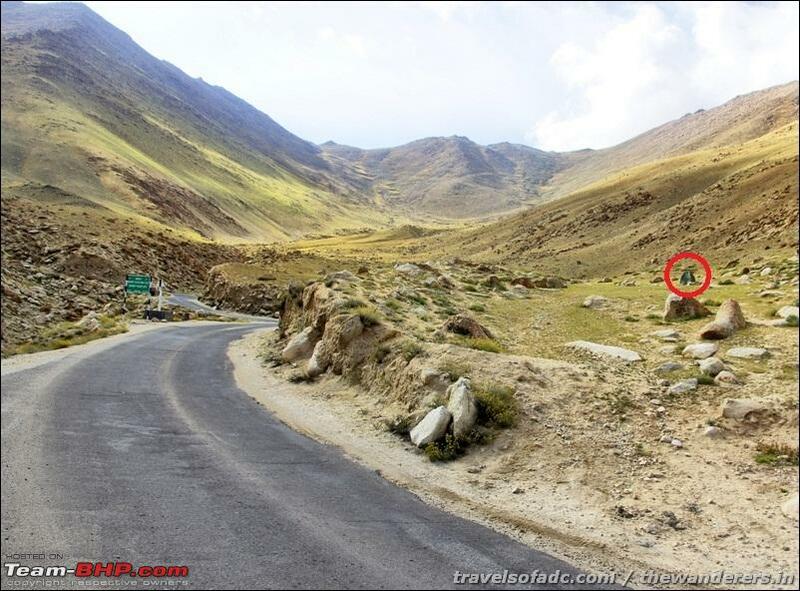 Serthi is also a junction, the road towards left is the one that is coming down from the lesser known Wari la - still remember how desolate it was when we had our drive over it in October 2010. 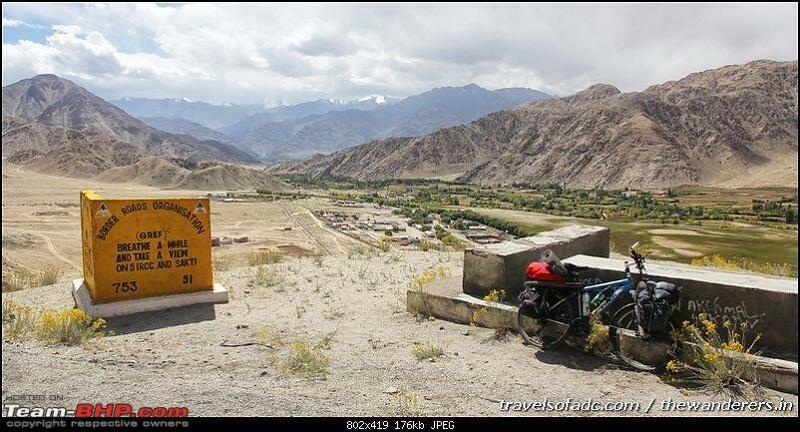 ...it is some 33 km to Chang la from here and Pangong some 100 km out from here. Well 33 km can be considered as "only" on a vehicle and not on a bicycle and more so not for a once in a year cyclist like me. The uphill has really started now and within a few turns, I get a bird's eye view of Serthi village and its expansive surrounding mountains. "Breathe a while and Take a view" and that is exactly what I did out here. Back to the mountains after almost a year and with the mighty Chang la mountain inclines having started in full earnest - It is 4 pm now and see a small yet quite good clearing. Had a few biscuits, chocolates and juice that I was carrying out from Karu, contemplating whether to stop for the day or continue till Zingral as was seen on that distance pillar at Serthi. By the time I finish contemplating and my food packet, it was almost 4:30 pm. 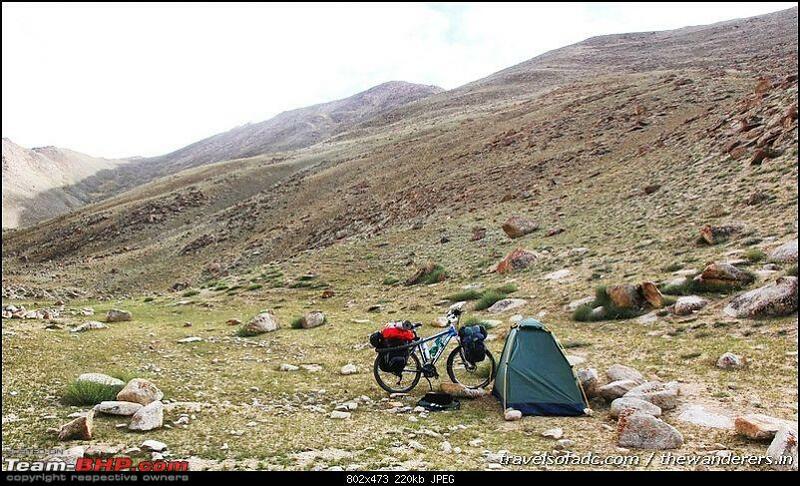 The small cleaning by the roadside looked great and with the incline being more and more brutal, cycling was out for the day and thought of camping out here for the night. ..and watch some pheasants go by. Quite a idyllic situation you may think - just finish reading the next post as to how the day ends!! Unpack and put up the tent. The stove is also taken out in case I think of cooking noodles, but then maggi noodles can be had even raw and it tastes quite okay too! Occasionally could hear a few taxis going by as they return from Pangong, but now by 6:30 pm it is all quiet now as dusk rapidly approaches. Temperature has plummeted quite a bit now with the sun behind the mountains - more or less close to zero degrees now in this 2nd week of September. Well, it was all normal till 6:30 pm. I am in the tent, wriggle into the sleeping bag, watching the last rays of light go. Light from the head torch now, take out that great Ladakh map printout of Tanveer and see go through it for sometime before I start to finally tuck in and fall asleep. But then what follows can be described as anything but normal, at least for myself. 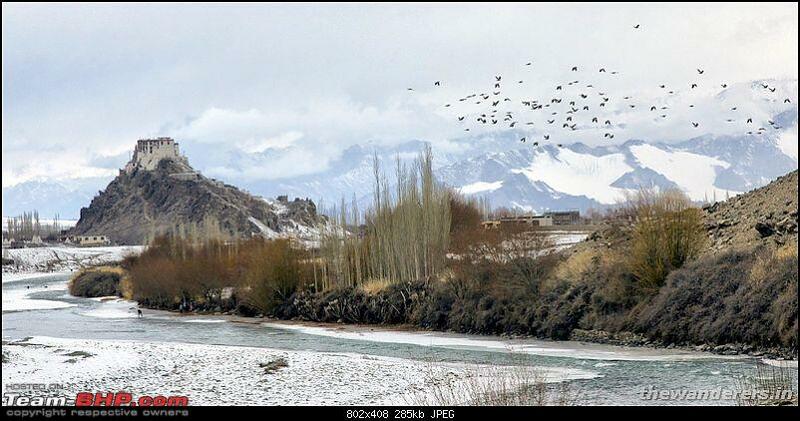 As said munching on some maggi noodles and just going through that Tanveer's Ladakh map as to while away time, I suddenly hear a kind of a long drawn out shout, a kind of howling one. Light has almost faded and all dark outside with only the silhouettes of the mountain heights just about lit up from the few last flickering rays. By the time I am able to get out of the tent, wriggling back out of the sleeping bag, the howling is has increased exponentially and more or less I have figured out the source - and from what I see it is just not a pretty sight with pitch darkness all around me - it does give me shivers, not from the zero degrees outside temp but a view of pack of wild dogs or wolves, numbering 10 around, far upon the mountain ridge. Only their silhouette is seen as such could not make out whether these are wild dogs or wolves, but one thing was sure they were almost quite a few in number - the howling in that isolated mountain side much more sinister and or even may I say blood curling accentuated by their barely visible silhouettes. But this gets worse if one can say so, there on the other ridge, a bit east of it, another new group starts howling - that typical long howling. One has to imagine vividly to understand my situation. There's not a soul around anywhere, the nearest village is way down somewhere. I am just there standing in the dark, the head torch now shut off, thinking furiously. 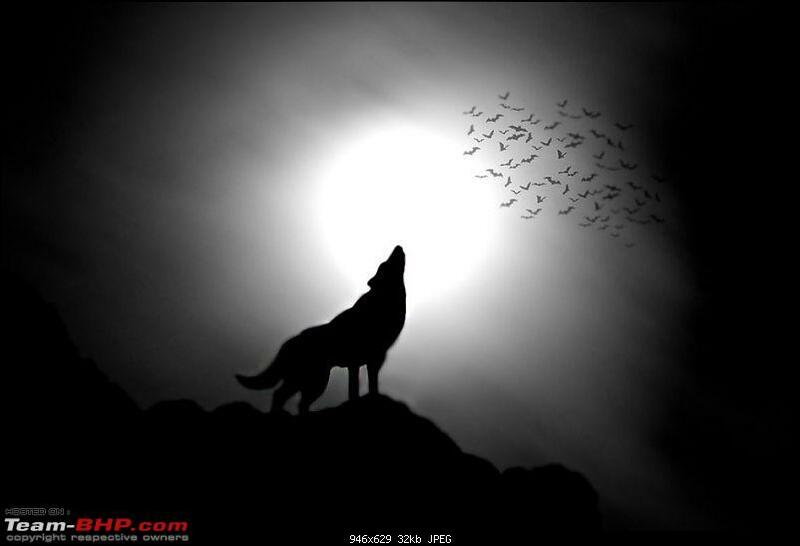 The only thing I can think of in the darkness is a sinister situation where a pack of wolves or wild dogs comes down from the mountain slopes in search of food - which of course is more scarce now as the winter falls. Meantime the howling continues somewhat intermittently and somehow I have this eerie feeling those are coming closer. Decision made - there is now way I am staying out here alone. 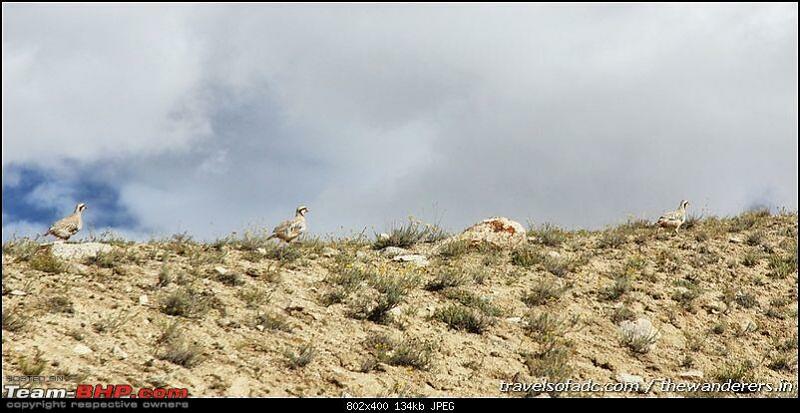 A pack of wild animals is totally different thing, having read quite a few stories of such attack though not from Ladakh region, but that did not matter now. Coming down to the now absolutely desolate road, I can see a few lone lights of far distant village down somewhere on the other side of the road, a particular light from a house a bit nearer than the rest. There is no time to pack. Gather my cycle, put on the head torch, take the knife, put on the backpack with the camera - even the extra lens are left out - no way I have the time nor the light to fully pack. The howling are somehow it seemed coming closer and closer. More importantly if those lone distant lights and in all probability those solar lights go off, I would lose all the bearings of where to go to. The head torch can no way light up the pitch darkness in this mountainous region. So, leaving all those things I go down to the road. 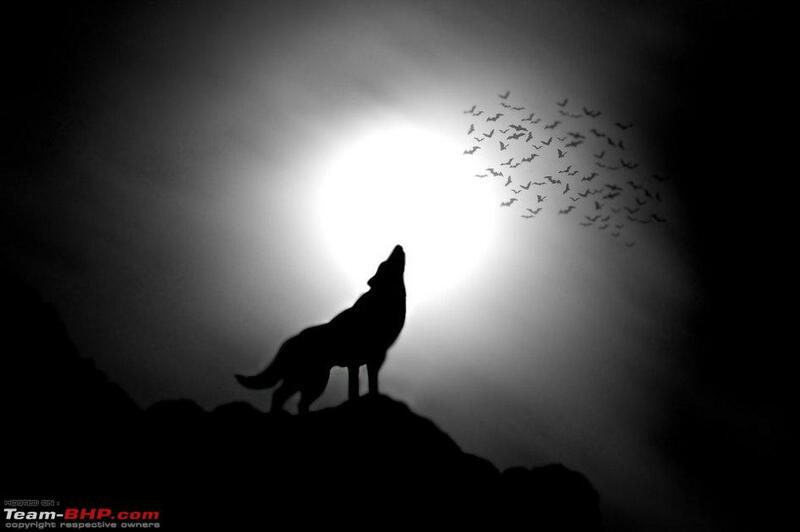 As said, howling still continues somewhere up behind me. In front of me by the road side, down somewhere I can see that lone light coming from a village house. It is quite a bit down - a single dusty track goes down steeply down most probably leads it to. Else the other option was going by the road, but the last settlement crossed was quite far away. With the steeply descending dirt track barely lit up by the head torch and with the bearing of that lone light from that village house, I tear down at around past 7:30 pm. I smile wryly as I get the deja vu feeling again. That almost dangerous bicycle downhill in complete darkness from Tanglanga la top to Rumtse in 2012 is eerily repeating itself, just that now it is a bit more worse and plus this being a dirt track with big rock boulders all around. 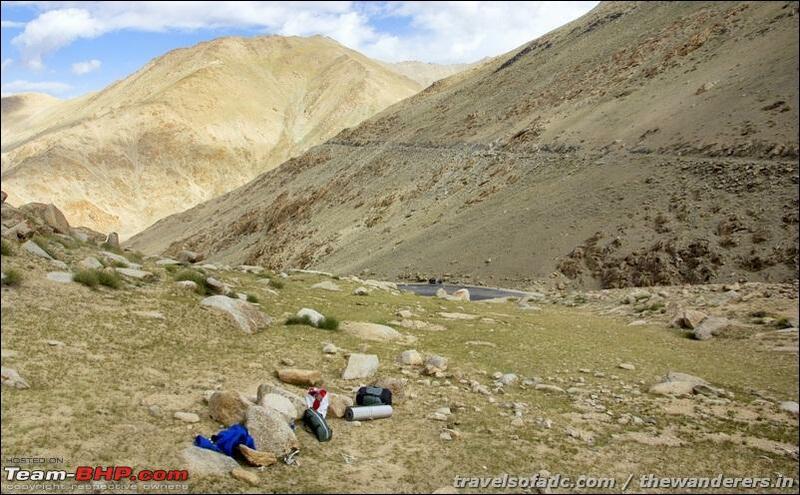 So much so for nostalgic camping out here like Tso Kar lake in 2012. I skid a number of times, only the hydraulic disc brakes of the Trek 4300 D saving me a couple of times from going tangentially off to the boulders beside. 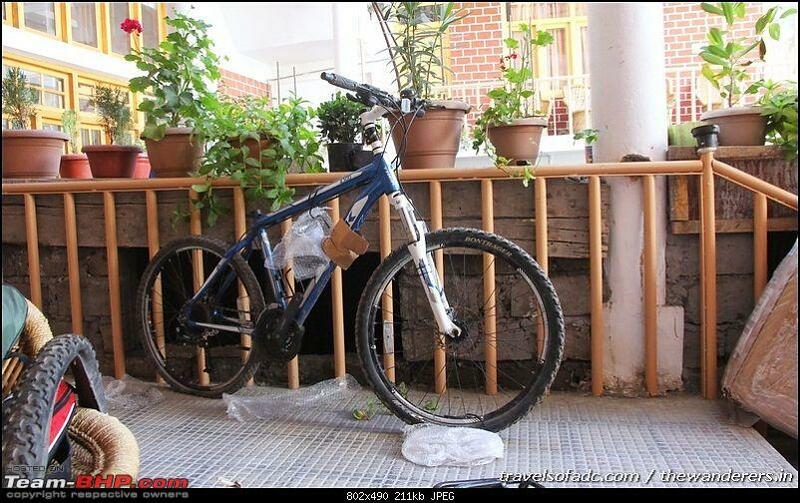 Again like in 2012, felt glad to have invested on these when buying a mountain tourer bicycle. 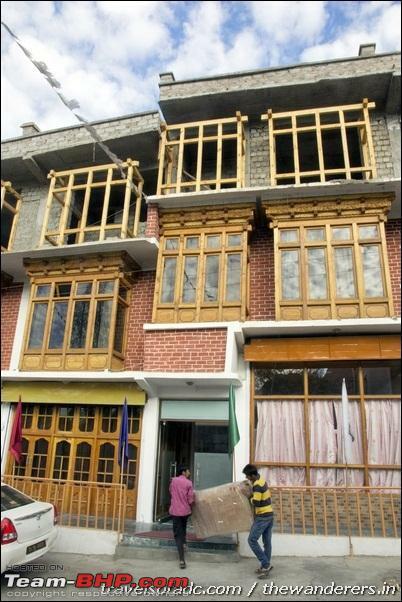 It took around may be 10 or 15 mts to arrive at the gate of the first house. The other lights are a bit away with fields in between. A village dog comes running out from somewhere barking furiously, but then I not worried about this one. A single domestic one is much, much better than a pack of wild - but anyway I keep the knife open now in the back pocket! Enter the compound and like any Ladakhi village house it all shuttered up to keep the bitter cold outside. Knock on the windows beside the main door, shout out "hello" between that dog's barking that is still going on furiously but that was keeping a distance from me. A gentleman and his daughter comes outside, I explain my situation in one breath - that I am tourist cycling towards Pangong, that I was camping outside on the hills, about those pack of wild dogs or wolves and their howls, that my tent and sleeping bag and with all my belongings is still up there - if he would be generous enough to let me sleep off night out somewhere, even the verandah will do! In all our travels to date, whether be our remote Safari drives or be the solo motorcycle journeys or the previous bicycle ride, have been quite fortunate and always have been grateful for receiving some great support from the common people of that land. Now read this - This gentleman not only takes pity on my situation, he welcomes me home - to a complete stranger who comes knocking at this late, late evening in this remote village, gives me hot water to freshen up, arranges for blankets and cups of hot tea and then comes up with dinner to see that I am well fed before we all go to sleep. I was at that time astonished by his welcome and still is - this is beyond the realm of understanding for most us, the city folks. Also I got a somewhat answer to my query - wild dogs or wolves do attack particularly for a single camper and there has been an isolated incidences but not exactly over here - but then I am glad to be here in one piece that is what mattered for now. The only things that I was carrying out from the abandoned tent site up in the mountains - my jacket and the backpack with the camera inside. 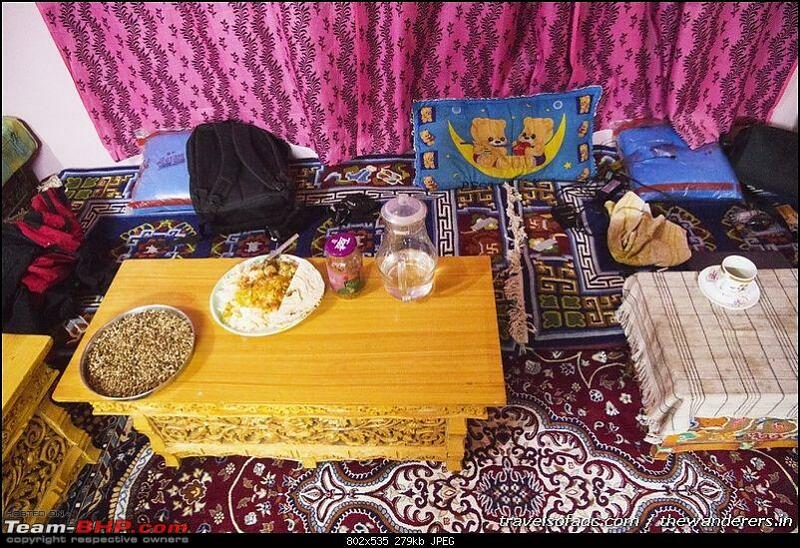 Dinner time and the host made sure that I was well fed. Impossible to fully express my gratitude in words, at that time and now even. As I gathered from him, this is a quite small village of around 20 houses or so. His is the first one and with fields surrounding and hence the solar light from this house was much before than the others which were still quite a distance away. Calling back home to Asmita was not possible as there is no mobile connection out here, though have told wife that most probably I would not be able to make any phone contact on day 1. Night is early in the mountains, more so in this high altitude tiny remote mountain village and by around 9/930 pm the solar light is put off and we all go to sleep. But before I doze off, I am compelled to think about all the rapid events of the last few hours on the very first day of this uncharted solo bicycle ride. There is no doubt that my adventures have just truly begun on day 1 itself! Thread moved from the Assembly Line to Travelogues. 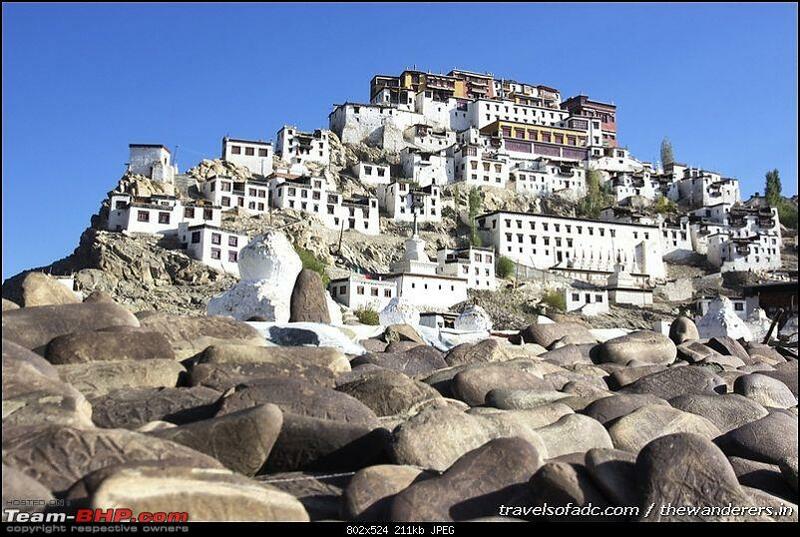 Thanks for sharing yet another amazing travelogue! 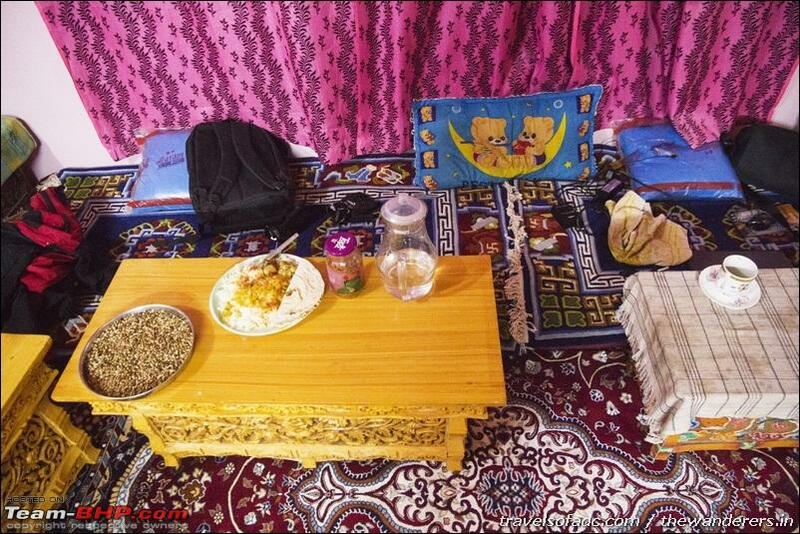 After that eventful night of day 1, wake up early morning to find my ever wonderful host, Mr Tashi, all ready with a breakfast of ladakhi rotis and tea. He also has to leave early morning due to some BRO work at Chang la for which a BRO truck will be coming soon to pick him up from the road end. Thank him again profusely and I move out along with him from that tiny village beyond Sarthi - Mr Tashi going out towards the point from where the BRO truck will pick him up and I go out trekking up along that dirt track that I came down hurtling at night. I hoped to see the tent and all things including expensive camera lenses out there still, which were all abandoned in so great hurry. A relief to see the tent and all still intact and exactly the way it was left. 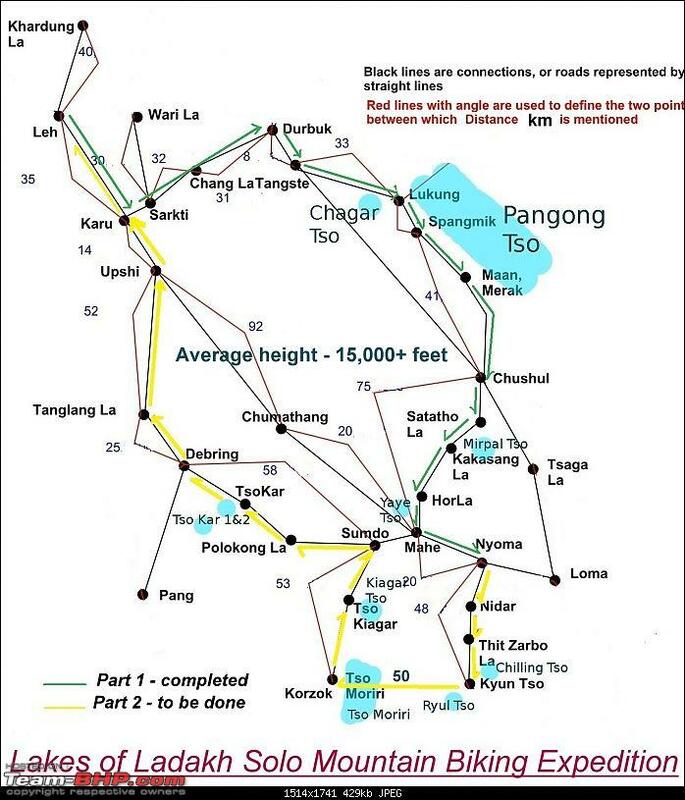 Packed up quick, the plan being to start on the inclines again and go as far as possible towards the mighty Chang la. 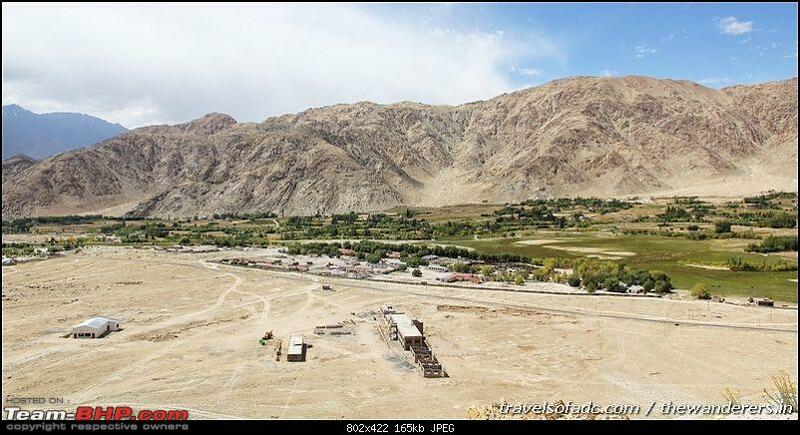 The dirt track and the village far away where the track ends is seen very clearly this morning - this was what was taken yesterday night to arrive at Mr Tashi's house. 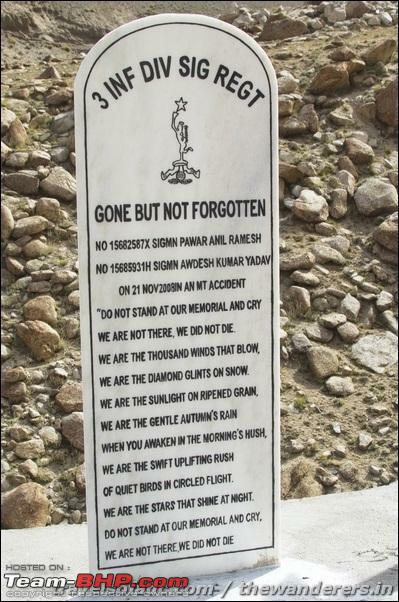 A memorial with some great words along the way. The inclines become much more steeper by the turn. 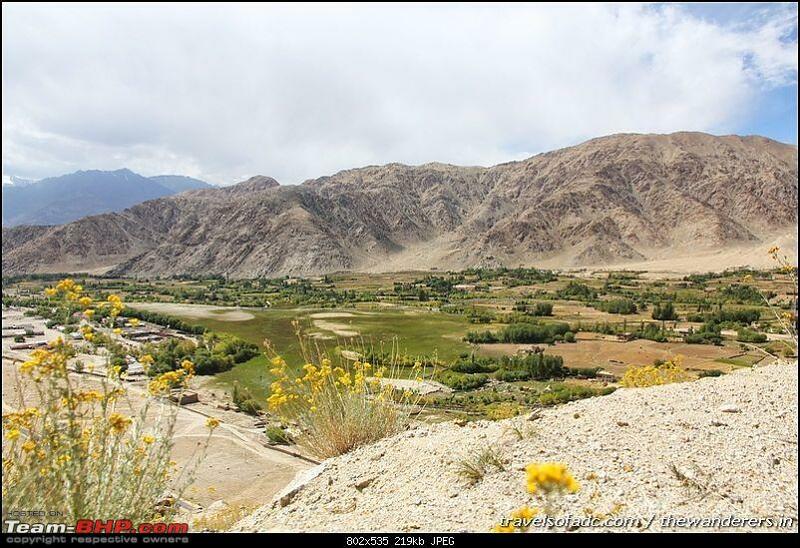 The last inhabited village this side of Chang la can be seen far away as the climb towards the mighty Chang la continues. Amazing as usual!! Can we say anything? We bow to you sir!! Dada you are at it again and what a start. The wild dog/wolf incidence is genuinely scary to say the least. 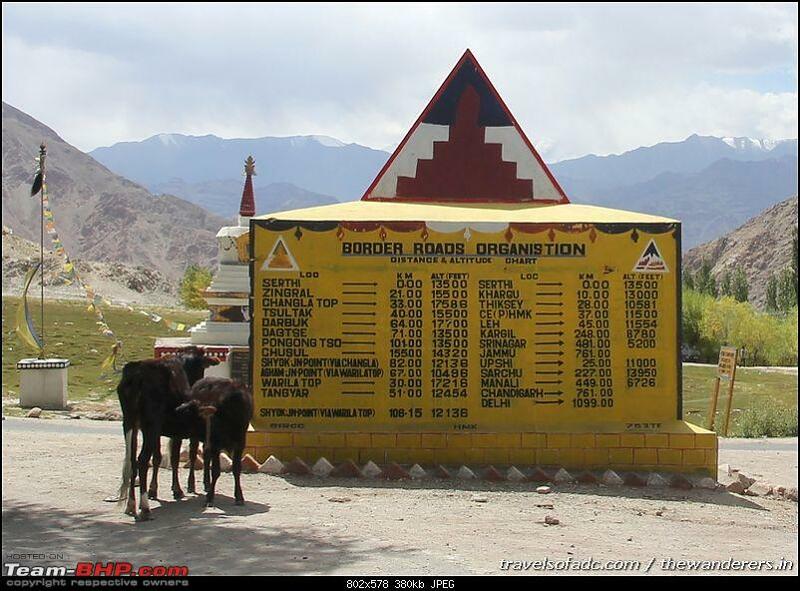 Similar horror stories about the wild dogs were mentioned in another biker's log on the journey through merak-chushul stretch. Now have to keep on coming back to this thread every few minutes hoping for an update. That must have been so scary with the wolves. Glad you decided to leave the tent and very happy you found shelter. Last edited by bblost : 21st July 2014 at 13:25.